The Woodbourne section of Jamaica Plain is bounded by Walk Hill Street, Wachusett Street, Forest Hills Cemetery Crematory and Catherine Street. Historically, it is divided into four sections: the Andrew J. Peters/Richard Olney land between Walk Hill Street and Eldridge Road, which was about 16 acres; the 30-acre Minot estate which at its greatest extent ran from the corner of Southbourne Road and Hyde Park Avenue to St. Michael’s Cemetery, and from Walk Hill Street to Catherine Street and Florian Street; the Boston North End Mission, a 4.6-acre tract along Southbourne Road and bisected by Goodway Road; and a portion of the Organ and Meyer land, roughly 5 acres on both sides of Catherine Street. Largely subdivided in three phases between 1890 and 1933, Woodbourne was the last of the philanthropic housing experiments which began after the Civil War. Woodbourne also represents the transition in housing ownership for the middle classes — that is housing listed at $3000 to $5,000 — which characterized the first quarter of the 20th century. This transition was from the two- or three-family house or the apartment building which dominated middle-class housing construction in the last quarter of the 19th century to the single-family house on its own lot of land. Within the borders of Woodbourne are the housing styles which would become so familiar in the post-war years of suburban America. More than anything else, Woodbourne was a deliberate attempt to attract the middle-class family into owning its own home in the city. One of the most important aspects of the social history of the 20th century is how the middle classes lived, worked, played and shaped the way America is governed. The 19th century is a study of the wealthy: who their ancestors were, how they got their wealth, how they lived, and of their business and philanthropic circles, because the wealthy shaped the contours of American social and civic life in the first century of the American republic. The history of Woodbourne begins as two estates of the wealthy. Indeed, the very name of the district is taken from the estate of one of the most illustrious families in Boston. On November 18, 1845, William Minot bought a large parcel of land for $2,800 “beginning at a cedar tree on the westerly side of Bourne Street … adjacent to the land of Ebenezer Weld” (Norfolk County Registry of Deeds, Book 160, p. 109). Minot and his two sons William Jr. and George would add to this property over the next twenty years. Most of the land was originally owned by Weld. Ebenezer Weld (July 4, 1775-1859) was a prosperous Roxbury farmer and a direct descendent of Captain Joseph Weld, one of the founders of Roxbury, of which Jamaica Plain was an integral part. William Minot was a direct descendent of George Minot who emigrated with the first English settlers to Dorchester on May 30, 1630. These two first families were joined by marriage in 1798, when Hannah Minot was wed to William Gordon Weld. William Minot bought the property for a summer home and he was soon joined by his children, William Jr., George, Mary and Julia. All four Minot children lived on the estate all year, while their father spent only the summer there. For over forty years the land was the happy home of the extended Minot family. As a founder of the town, George Minot received a land grant which he extended to cover both sides of the Neponset Estuary including most of present day Squantum (then part of Dorchester). He built a wooden house about 1640 on what is today Chickataubut Street above the Neponset River. This house was passed down to the eldest son of each generation, and William Minot of Woodbourne owned it at his death in 1873. The house burned in November 1874, but the land remained in the family until the early years of this century. Stephen Minot (1711-1787) was a leading merchant of Boston and is the first recorded Minot to establish what would become a significant presence in the business, financial and legal circles of Boston for the next two centuries. Stephen was born a British subject and died an American citizen in a house on Devonshire Street at the corner of Spring Lane (where the Minot Building is today, at 111 Devonshire Street). Stephen was also a founder of King’s Chapel, the seat of Anglicanism in Boston, the dreaded Church Of England, the power from which George Minot had fled to the New World. At the time of his death, he was a member of Old South Meeting House at the corner of Milk Street not far from his home. The Minots of Woodbourne are descended from Stephen’s youngest son George Richards Minot. Scholar, historian, lawyer and judge, George Richards Minot moved among the highest political circles of his day in Massachusetts during and after the Revolutionary War. (It was his niece, Hannah, daughter of his oldest brother Jonas Clark, who married William Gordon Weld.) Born in the house on Spring Lane in 1758, a British subject like his father, he studied law and was admitted to the Massachusetts Bar in 1782. Shortly thereafter, he established a law office at 39 Court Street (then called Prison Row because the Court House — opposite Minot’s law office — dominated the street). He hung his sign on an apple tree. Five generations of Minots had their law office at that address (Staples Office Supply occupies the site today). He established himself as a public speaker in 1777 when he gave a funeral oration for his law tutor John Wadsworth. G. R. Minot’s most famous address was “An Eulogy on George Washington Before the Inhabitants of the Town of Boston,” on January 9, 1800. On March 5, 1782, as Orator of Boston, he gave a speech on the Boston Massacre. In 1780, George Richards Minot was appointed the first clerk of the newly-established House of Representatives shortly after the adoption of the Massachusetts Constitution. Eight years later, he served as Secretary of the convention presided over by John Hancock, which ratified the Federal Constitution. (The vote was a close one: 187 in favor, 168 opposed.) He moved on to become Judge of Probate and Chief Justice of the Court of Common Pleas before being appointed Judge of the Municipal Court of Boston in 1800. George R. Minot was also one of the earliest historians of Massachusetts. In 1788, he published an account of Shay’s Rebellion, A History of the Insurrections in Massachusetts in the Year 1786. On January 24, 1791, he was one of the 10 incorporators who met (allegedly in his law office) to establish the venerable Massachusetts Historical Society. His magnum opus is the elegantly-written two-volume Continuation of the History of the Province of Massachusetts Bay from the year 1748 to 1765. The title referred to Governor Thomas Hutchinson’s History of the Province of Massachusetts Bay from the first settlement thereof in 1628 until the year 1750 (published in 1767). (Hutchinson, a contemporary of Stephen Minot, was the last American-born Royal Governor of Massachusetts Bay.) Volume I of Minot’s History was dedicated to President John Adams on January 1, 1798. It was Minot’s intention to write a history of the Commonwealth through the beginning of the War of Independence in 1775, but Volume II was published posthumously in its incomplete condition in June of 1803. George Richards Minot died of tuberculosis at the age of 44 on January 3, 1802. The man who bought the tract on Bourne Street was the only son of George Richards Minot. William Minot was born in the house on Spring Lane on September 17, 1783. William was of that generation which saw the change from residential to business and commerce in those ancient streets around today’s financial district. The property was leased to Safford and Law Blacksmiths by 1830. After his marriage in 1809, he lived on Charles Street. Then in 1817, he bought land on Beacon Street opposite the Boston Common for $3000 on which he built a fashionable townhouse. In 1824, it was damaged by a fire which gutted six adjacent buildings. Minot’s was the least damaged and he quickly rebuilt. It is a building of elegant detail of brick with a distinctive white wood porch capped with wrought iron in the High Regency style of 18th-century London. It has been suggested that the architect was Peter Banner, who designed Park Street Church in 1809. One reason for this suggestion is that both buildings are distinguished by tall thin wooden columns supporting an entablature across the face of, and in contrast with, the red-brick facade. Unlike his two sons, William Minot never lived year-round at Woodbourne, only the summer months. His home was at 61 Beacon Street for 60 years, and he died there on June 2, 1873 at the age of 90. He died with an estate worth $364,000. By contrast, his grandfather Stephen died bankrupt. After graduating from Harvard, he was admitted to the Massachusetts Bar in 1805. He married in 1809 and he and his wife had five children, all born at the Charles Street house. Four would live at Woodbourne: George Richards Minot II (October 29, 1813 to February 18, 1883); William Minot Jr. (April 7, 1817 to February 26, 1894); Julia Minot (January 23, 1823 to March 22, 1875 ); and Mary Minot (November 1, 1811 to February 18, 1882). The fifth child, Francis Minot, was born in 1821. He graduated from Harvard Medical School (then on Mason Street near the Common) in 1844 and set up his own practice at 144 Charles Street. He joined the staff of Massachusetts General Hospital as a surgeon in 1859 and practiced there until his death at his home in Milton in 1899. He had a townhouse at 65 Marlborough Street. In 1846 William Minot was listed in the self-described directory of “Boston aristocracy,” Our First Men of Wealth, Fashion and Gentility, as being worth $100,000. (His kinsman, William F. Weld, commission merchant at Central Wharf, was listed as being worth $100,000.) When William Minot bought the land for his summer house in 1845, Bourne Street had been a public way for at least 25 years. It connected Walk Hill Street — a very old 17th-century public road — with Canterbury Street and Canterbury Village. Walk Hill Street began at the Toll Gate. The neighborhood took the name from the privately-owned Norfolk and Bristol Turnpike which was incorporated in 1803 and connected Boston to Pawtucket, Rhode Island. Called the Dedham Turnpike in Roxbury, the toll road went from Dudley Square to Dedham Courthouse along present-day Washington Street. The toll gate where carts and wagons were weighed and the fee charged according to that weight was at the intersection of South and Washington Streets. It was the first gate outside of Dudley Square. On March 31, 1824, the Norfolk and Bristol Turnpike Corporation took out a mortgage for land in Dedham and 16 acres in Roxbury (Norfolk: Book 72, p. 37). The more melodic “Forest Hills” was applied to the district after Forest Hills Cemetery opened in 1848. It was the opening of the Boston & Providence Railroad on June 11, 1834 with a station at Toll Gate which opened up the farmland of western Roxbury for country houses. The railroad also put the toll road out of business. The turnpike became a public way in June, 1857. It was renamed Washington Street from Dudley Street to the Dedham line on June 16, 1874. William Minot and his son George built their houses in 1846; William had his built in 1847. The homes were no doubt designed and built by housewrights. The same man who had an elegant townhouse built for him would more than likely want the same craftsmanship for a country retreat; in 1873, the country house and land was appraised at $10,000. One imagines the houses as simple but well built by men skilled in use of wood, duplicating the proportions of a farm house. Perhaps they consulted one of the house pattern books of the day, such as J. C. Loudon’s Encyclopaedia of Cottage, Farm and Villa Architecture (1833) or maybe even Andrew Jackson Downing’s new book on the landscaping of country houses (1841). The houses probably had steep gables and dormer windows, stone chimneys, a kitchen wing at the back leading out to vegetable gardens and, of course, a verandah facing southwest and the Blue Hills. The houses were connected by a common avenue, which turned off Bourne Street where the intersection of Northbourne Street is today, and were set on a ridge which is present-day Bournedale Road. William’s house was approximately where number 41 Bournedale is, George’s house about on the site of number 27, and number 9 Bournedale was the home of the two sisters. Each house had a view of the Blue Hills to the south with a meadow sweeping down to Stony Brook at the edge of the property. On June 5, 1855, William Minot Jr. sold 4 ½ acres of land on the east side of Bourne Street to Charles Eliot Guild for a summer house. This was a triangular-shaped parcel originally part of Ebenezer Weld’s farm. Guild paid $4,800 for the parcel which — judging by its price — may have had a building on it (Norfolk: Book 236, p. 308). Guild did have a house on the lot. It was the home for some years of Massachusetts Governor Curtis Guild. The drive to the house was located at the corner of Bourne and Northbourne and the house itself was situated approximately on the site of number 43 Eastland. The house stood until about 1920. After Charles Guild died, the land was bought back by Minot on July 11, 1889 (Suffolk: Book 1887, p. 529) and rented out. The name “Woodbourne” was chosen by Julia Minot, the invalid daughter of William Sr., from the home of Guy Mannering in the Waverly Novel of the same name published by Sir Walter Scott in January, 1829. The novel’s name was a good pun on the woods of Bourne Street, but the description which Scott wrote of the estate in the Cheviot Hills of Southern Scotland obviously reminded Julia Minot of her own home: “Woodbourne was a large comfortable mansion snugly situated beneath a hill covered with wood, which shrouded the house upon the north and east; the front looked upon a little lawn bordered by a grove of tall trees; beyond were some arable fields, extending down to the river, which was seen from the windows of the house. [Mannnering] resolved to place himself at the footing of a country gentlemen of easy fortune” (Guy Mannering, Vol. I, Chapter XIX, 1895 edition). The Minot estate was substantially enlarged on July 16, 1850 when William Minot and his two sons William Jr. and George Richards paid $3,120 for a large parcel on the east side of Bourne Street from Walk Hill to present-day Catherine Street, approximately up to the line of today’s St. Michael’s Cemetery (Norfolk: Book 195, page 274). This was originally Ebenezer Weld’s land. In 1864, William Minot Jr., who lived all year at Woodbourne in his father’s house, acquired a parcel of land which included three houses on Bourne Street where number 114 and number 124 Bourne are today at the corner of Eastland Street (Norfolk: Book 322, p. 125). This would be the southeastern limit of the Minot property. The western extent was a parcel “on a lane from Bourne Street and Stony Brook” which George Richards Minot bought from Ebenezer Weld on May 1, 1856 (Norfolk: Book 245, p. 41). This large parcel is today covered by houses bounded by Wachusett and Florian Streets and Southbourne Road. 42 Bourne St. Built in 1933. George Richards Minot, William Minot’s first-born son, built his summer home in 1846 on a lot 100 feet from his father’s. After attending the boarding school kept by his kinsman Stephen Minot Weld at Centre and South Street in Jamaica Plain, George became a merchant like his 18th-century ancestor Stephen Minot. George entered the mercantile firm of Chandler and Howard on Commercial Wharf as an apprentice at the age of 16 in 1829. He served on East-Indian trading ships for about ten years before he opened his own Indian trading company, Minot and Hooper of Marblehead, in 1839. The ships he owned worked the ports of India, China and Boston until trading dropped off during the financial panic of 1857. Minot and Hooper then removed to Milk Street opposite Old South Church and became a selling agent for Southern cotton mills. The firm later moved to a building on Kingston Street where it was destroyed in the Great Fire of 1872. Minot was in Europe at the time, but he quickly rebuilt the company which was taken over by his son George Richards III. George suffered from angina and on December 4, 1883 he had a heart attack and died at Woodbourne. He was struck while supervising the construction of a townhouse at 245 Marlborough Street which the architectural firm of Cabot and Chandler had designed for him. His wife and children moved from Woodbourne to the Marlborough Street house in April, 1884. No one loved Woodbourne more than William Minot Jr. A seemingly introspective man, he found great comfort and happiness with his family about him in his gardens and fruit trees at Woodbourne. It was the one place where his father and brothers and sisters and their families and friends could be together. He was born on Charles Street in 1817 but was raised in his father’s house at 61 Beacon Street. As a boy he played in the brackish marshes of the tidal basin, where the Public Garden is today, and the Charles River. While shooting on the Charles, he shot off his thumb, and he wore a sheath over his hand all his life. But the spirit of death visited Woodbourne. His father William Minot Sr. died in 1873 and in 1875 his sister Julia died in her house at Woodbourne. His other sister died in 1882. His wife Katharine died in 1880 and in 1883 both his brother George and his beloved little Alice died, leaving the houses and grounds of Woodbourne full of only ghosts. The loneliness became too much for him to bear, and so in the early part of 1884, William Minot Jr. moved into a townhouse at 22 Marlborough Street, one-half block from the Public Garden. Until his death in 1894 at the age of 77, he took up yachting, perhaps in memory of his seaman- and shipowner-brother George. Thereafter Woodbourne was never the permanent home of the Minot family. The estate reverted back to a summer home, and perhaps one or two houses were rented, until it was sold in 1911 and the houses pulled down. The Minots of memory are not far from Woodbourne. Three years after William Minot purchased the first of the parcels that became his family’s estate, Forest Hills Cemetery was consecrated in June, 1848. On July 24, 1858, Minot bought a terraced lot at Forest Hills, from which could be seen the outline of his estate on Walk Hill Street. An underground tomb was constructed for the remains of William, his sons and daughters, their wives and children, all those who lived and loved at Woodbourne. On November 9, 1858, he sold the Minot family tomb #22 at the Old Granary Burial Ground for $100. Soon after, William had the remains of his father George, his grandfather Stephen and their wives removed to the tomb at Forest Hills. In all, 25 family members are buried there, the last of whom died in 1985. In keeping with the fashion of the rural cemetery, of which Forest Hills is a fine example, the names are carved on huge slate slabs set flush to the ground. The second estate belonged to Richard Olney on Walk Hill Street, which extended down to Hyde Park Avenue. A leading authority on railroad law, Olney served in the second administration of President Grover Cleveland, first as Attorney General from 1893 to 1895 and then from 1895 to 1897 as Secretary of State. In the phrase of his biographer, Gerald Eggert (1974), Olney was an outlander: neither Boston-born nor nurtured at Harvard as the writers of obituaries were careful to note (particularly the Boston Evening Transcript). Pugnacious and brusque, with a famous bad temper, Olney certainly cared nothing for that opinion as he amassed a fortune as a corporation lawyer and advisor to the wealthy. Like his neighbor William Minot, Olney’s life straddled epochs in American history: Minot was born at the dawn of the American republic and lived through the test which demonstrated that the republic could survive fratricidal war intact. Olney was born in the Age of Jackson, the birth of nationalism, and lived to see America occupy the world stage in the Age of Woodrow Wilson. Also like Minot, Olney’s roots went deep into the founding of Massachusetts Bay, although even then as an outlander. His forefather Thomas arrived in Salem from England in 1635 and became allied with Roger Williams. Together, they were banished to Rhode Island in 1637 for refusing to adhere to the views of the Puritan oligarchy of Massachusetts Bay. The courageous Thomas Olney became one of the 13 proprietors of Rhode Island, a founder with Williams of Providence, and went on to establish the Baptist church in America. It was there in Oxford that Richard Olney was born on September 15, 1835. His father was a successful and wealthy cotton manufacturer. After attending Brown University in Providence, graduating in 1856, he took his law degree from Harvard Law School in 1858. He worked in the law office of Judge Benjamin F. Thomas in Boston from 1859 until the Judge’s death in 1878. Olney specialized in wills and trusts, again like his neighbor Minot. Indeed, all his life Olney’s office was at 23 Court Street, a few steps away from the Minot building at number 39 Court. On March 6, 1861, Olney married Agnes, the daughter of Judge Thomas. Ever the outlander, Olney was a life-long states’ rights Democrat who believed that the South had a right to secede from the union peacefully. This is understandable since Olney’s family fortune depended on a free flow of plantation cotton to run their mill in Oxford. He backed up this belief by hiring a substitute to fight in the Civil War, which erupted soon after his marriage. On April 18, 1864, Olney paid $5,300 for 10 acres of land with a house and stable on Walk Hill Street, abutting the land of William and George Minot (Norfolk: Book 322, p. 126). Olney was no doubt a friend of the Minots — he practiced law on Court Street near William Sr. and both shared in the work of managing trust funds for the wealthy. The move to Forest Hills was more than likely influenced by this professional and personal friendship. Olney took out a $4,500 mortgage with the cotton broker George Richards Minot, with whom his family no doubt did business. Five years later, on September 15, 1869, Olney joined in partnership with Andrew J. Peters, and paid $16,805 to the Roxbury Grammar School for 18.67 acres of land extending from Olney’s property across Hyde Park Avenue to the line of the Boston and Providence Railroad (Norfolk: Book 384, p. 194). Peters was a prosperous merchant and landowner who lived on an estate on South Street on the edge of Toll Gate. His land extended to the Turnpike. Most of that property today includes Asticou Road, some of Martinwood, and American Legion Post No. 76. His son Andrew J. Peters, born on the estate on April 3, 1872, served as Mayor of Boston from 1918 until 1921. He had the misfortune of presiding over the infamous Boston Police strike of 1919. Between Peters and Olney, they owned the land that encompasses all of Patten, Rodman, Eldridge and Wachusett Streets from the Parkman School to number 235 Wachusett, and on both sides of Hyde Park Avenue from Walk Hill to Ashmore Street. This was a wise investment: the City had recently completed the extension of Hyde Park Avenue from Cummins Highway (then called Ashland Street) to Walk Hill. The Roxbury Grammar School — or Roxbury Latin School — is one of the oldest schools in America, founded on August 31, 1645. Joseph Weld, Ebenezer’s ancestor, was one of seven governors of the school. Other Governors included Thomas Dudley, Governor of the Massachusetts Bay Colony, and Reverend John Eliot. One of the incomes to maintain the school was from the distribution by the Town of Roxbury of the “Great Lots,” land situated between Franklin Park and Beech Street. Roxbury Grammar School was given a portion of the Great Lots about 1650, the income of which went to support the school. For example, about 17 acres were leased out in 1670, and in January, 1687, 35 acres “of woodland lying at Walk Hill” was leased to farm for 500 years. Olney and Peters bought one of those parcels at the time when Roxbury Latin School was on Kearsarge Avenue above Dudley Square, and it needed funds for expansion. Olney’s house still stands, although somewhat altered, at 56 Patten Street. It had one of the first tennis courts in Boston on which the neighboring families of Charles Guild, George R. Minot and William Minot would meet and play. On January 10, 1873, the Town of West Roxbury (for Jamaica Plain had separated from Roxbury in 1851) took a portion of the Olney/Peters land for the widening and dredging of Stony Brook (Norfolk: Book 434, p. 311). Richard Olney became wealthy and famous in his day as one of Boston’s leading authorities on railroad law when, at the age of 40, he reorganized and saved from financial failure the Eastern Railroad Company which served northern New England. Thereafter, he devoted his career to the regulation and consolidation of railroads, the lifeblood of the American economy. He joined the Board of Directors of the Boston & Maine Railroad in 1884 and served as its general counsel for 30 years. By 1893, Olney’s clients included the business and financial elite of Boston as well as some of the nation’s major railroads. When Grover Cleveland was assembling his cabinet for his second administration, he was anxious to include a New Englander. Olney’ s professional connections within Cleveland’s advisors recommended him and he was appointed Attorney General of the United States in 1893. In 1894, he negotiated the end of the strike by workers of the Pullman Palace Car Company which had crippled rail commerce in Chicago and the Mid West. Olney’s intervention resulted in a loss by the union. On the other hand, in that same year, he protested the discharging of all men employed by the Philadelphia and Reading Railroad unless they resigned from the Brotherhood of Railway Trainmen. The order was lifted after Olney stepped in and the men returned to their jobs with their union cards. Also as Attorney General, he successfully argued the unconstitutionality of the 1894 Income Tax Law before the Supreme Court, a law he would see enacted under President Wilson. By then, Richard Olney was far away from Walk Hill Street. On February 8, 1882, he sold both his house and property and his portion of the adjoining parcel to his business partner Andrew J. Peters for $27,100. He moved his family first to 175 Marlborough Street and then in 1884 into a newly-built townhouse designed by Samuel D. Kelly. This townhouse — between Exeter and Fairfield Streets — was next door to the house of George Richards Minot at number 245 Marlborough Street. In 1890, he commissioned Charles McKim of McKim, Meade and White to design a townhouse for $40,000 at 415 Commonwealth Avenue overlooking the recently-completed Back Bay Fens at Charlesgate East. Olney lived there for the rest of his life. On October 28, 1890, Richard Olney’s daughter Agnes married George Richards Minot III in a ceremony held at the Olney summer house in Falmouth. George Richards Minot carried on his father’s business at Minot and Hooper. Their only son Francis was born on November 8, 1891 at a large rented house in Milton. Soon after, George and Agnes bought many acres of land on Brush Hill Road near Great Blue Hill and built on it a comfortable, roomy house. In January, 1894, George, Agnes, and young Francis were moving into Olney’s townhouse for the winter when George caught the influenza from exposure to the cold. He died of pneumonia on January 26 at age 45. Richard Olney retired from government at the conclusion of the term of President Cleveland in March, 1897 and returned to his law practice. In 1904, he was appointed a trustee of the Benjamin Franklin Fund, which William Minot Sr. had managed for over 60 years. The trustees voted to found a trade school with some of the income of the fund so that working men could gain more skills and advance into managerial and supervisory positions. The Franklin Union was erected on Berkeley and Appleton Streets in 1908. Olney established the school as a corporation and served as its first president until he died. Olney never lost interest in international affairs. President Wilson offered him the post of Ambassador to Great Britain in 1913, but he declined. Olney supported Woodrow Wilson’s foreign policy toward an increasingly-belligerent Germany, and he died on April 8, 1917, two days after Wilson asked Congress to declare war. At first the legislature refused to incorporate the Mission because there were so many single women as officers. The Mission was finally incorporated in 1870 as the Boston North End Mission. Eben Tourjé, the founder and Director of the Conservatory of Music, was one of the Mission founders. He became Superintendent of the Sunday School in 1867 and served a term as Board President. There was an industrial school in the building which taught the young women and girls how to sew to make their own clothes and to learn the seamstress trade. The Mission held seven religious services a week in which they made every effort to attract the sailors off the ships docked at the nearby wharves. Temperance meetings were held every Saturday. The Mission Board was particularly proud of its Thanksgiving and Christmas dinners held at 201 North Street. This changed about 1875 to Thanksgiving food baskets. Bags of vegetables, meat or poultry, fruit, sugar and tea — all donated by individuals or businesses — were given out in proportion to the size of the family. The North End — like East Boston — was the great entry port for immigrants to Boston from Europe and they packed into rickety old wooden buildings — many of which were 17th- and 18th- century homes broken up into tiny apartments. Today’s cramped, narrow streets of the North End give a good idea of how the community looked when the North End Mission was there. The North End of the 1870s was overwhelmingly Irish Catholic, although German Jews trickled in and the great migration of Italians was just getting started. In this light it is interesting to note that the Mission served primarily Protestants (“with delegates from the Hebrews,” as the 1876 Annual Report of the Mission wrote). Most of the women to whom the Mission was primarily devoted were more than likely farm girls from Maine, New Hampshire, Vermont and the rural parts of Massachusetts, who were attracted to Boston to work for better wages in factories. When they lost their jobs, such as during the severe recession of 1873, they wandered the streets. Some others were no doubt prostitutes and barmaids; after all, this was a seaport. The trustees of the Mission purchased the land at Woodbourne for the same reasons as the Minots: it was in the country surrounded by open land and shade trees, a complete change from the crowded city near the Mt. Hope Railroad Station. The Curtis-Willams estate was acquired as a summer home for children as well as a year-round home for some of the women in order to remove them (as several Annual Reports stated) from “the temptations of their former lives.” The Trustees called it the Mt. Hope Home. This may have been the name of the estate which occupied the site, because a substantial brick house had been built near the corner of Bourne and Florence Street, probably before the Civil War. Its entrance drive came off Bourne Street at the corner of Florence where number 85 Bourne is today. The property had a large pond at its far corner where Florian and Goodway Streets are today (it had been filled in by 1914, probably after the cholera epidemic which swept through the region in 1909). In 1874, 86 women lived in the comfortable home on the estate, about 36 every six months. The Mission emphasized daily church services and scriptural readings. Attached to the house, the Mission set up a laundry in which the women and girls took in washing and ironing from surrounding families. A horse and wagon picked up and delivered. The laundry brought in some income to the Home — $1,035 in 1875. It cost $4,765 to operate the Home that year. The seamstress school also continued. In the days before government and state subsidies and grants, charitable institutions lived by the donations of individuals and companies. The Annual Reports of the North End Mission from 1876 to 1883 list several pages a year of people and businesses who gave money in $5 and $10 increments, and sometimes higher amounts, as well as clothing, food, bedding and furniture. Women volunteered to work and teach at The Mt. Hope Home and at 201 North Street. But all this could not sustain keeping the Home open all year and in 1877, the trustees closed the Home for women and kept it open only as a summer camp for children. The camp was very important to the trustees and the benefactors of the North End Mission. The 1876 Annual Report described that “the pale little faces seen in such numbers in the neighborhood of the Mission — often peering in at its doors — have long appealed to the sympathies of those who labor there. Friends of the Mission conceived the plan of opening a summer home, to give the children of the poor a glimpse of God’s beautiful world, a respite from noise and strife, and a few weeks of pure air, good food and tender treatment. A large and well ventilated building on the Mount Hope Home estate, with a cottage attached, was fitted up for them, with 59 roughly made bedsteads in two large chambers.” The Mt. Hope Home was like all summer camps for kids: the days were filled with story telling, games, singing and romping in the fields. As many as 104 children a season — from infants to the age of 14 — spent the summers there in two-week stays, “enjoying pure country air, fresh milk, a tidy home and out door play. [A] great change from the miserable life in the pestilential air of North End tenement houses” (1875 Annual Report). Yet some died there too; one was buried at a donated lot in Forest Hills Cemetery and a little Jewish boy succumbed to whooping cough. It does not seem that the Minots altogether enjoyed having the Mt. Hope North End Mission as neighbors. In eight years of Annual Reports, no Minot is listed as contributing cash, food, bedsheets or even a diaper. Perhaps they hired one or two of the women as domestic servants or cooks or had their laundry done at the Home. In 1906, when the Minot heirs first set down to sell off their estate as house lots, they put as a restriction that “no public or private institution, such as hospitals, sanitoriums or for any religious, educational or charitable purpose” could be built (Suffolk County Deeds: Book 3139, p. 404). The Woodbourne district began to be subdivided into house lots from farmland and country seats on May 22, 1888, when about 10 acres of land were purchased by Frederick Organ from Charles F. Curtis (Suffolk: Book 1822, p. 406). This was part of Thomas Weld’s land which he bequeathed to Elizabeth Bradstreet in 1821. Catherine Street — then called Spruce Street — had already been built through the property in 1874. It was renamed Catherine Street on December 28, 1893. Organ entered into a business partnership with Andrew J. Meyer in 1889. Their property extended from the Mt. Hope Home almost to Halliday Street. Where Organ Park Street dead ends today is the extent of the Organ and Meyer subdivision. The deed to the land was subject to the following conditions: “For a period of 20 years from January 1, 1888, no building placed or erected shall be for the manufacture or sale of liquor or for carrying on any business offensive to good morals or injurious to health. Buildings shall be worth at least $1500 with a ten foot set back” (Suffolk Deeds, Book 1822, p. 406). Building permits for most of the houses on Catherine Street cannot be located. There are 25 homes on the street; 11 were built by 1890, including number 25, number 26 and number 58. Number 64, also built by 1890, is now a vacant lot at the corner of Florian Street. The house opposite, number 63, high above Florian Street, also dates from 1890. The lots numbered 58, 60 and 64 backed up to Stony Brook. In 1898 and 1899, the City of Boston partially relocated and widened the brook through the Organ and Meyer property. The City of Boston put the brook in a culvert in 1934. Number 40 was issued a building permit on May 7, 1895. Number 6 Meyer Street is a triple decker completed in 1894. The street was largely built up by 1896, when 17 homes had been completed. These included the distinctive twin houses at numbers 10 and 12, with Norman-style corner towers and bracketed porches, built by 1896. The two-family corner house with the built-in store front at the corner of Bourne Street was also built by 1896. Its neighbor, number 15 Catherine Street, was built by 1890. These homes no doubt profited from their close proximity to Mt. Hope Railroad Station. Some of the children of the new families probably began their education at the Canterbury Primary School on the corner of Bourne and Canterbury Street, where St. Michael’s Cemetery Chapel is today. Later houses on Catherine Street changed the nature of the community to multi-family dwellings. J. Silensky of Deering Road in Mattapan built the large six-family house at number 34 in 1916. In 1928, a two-family building was built at number 25-27. As far as architectural styles go, Catherine Street is the most eclectic in the Woodbourne District. In August of 1895, work began on the elevation of the Boston & Providence line of the New York, New Haven and Hartford Railroad. A huge granite wall 4.5 miles long from Cumberland Street in the South End to Forest Hills was completed at the end of 1897, which eliminated all grade crossings. At Forest hills, a huge five-arch granite viaduct designed by Shepley, Rutan and Coolidge, completed in 1898, carried the Arborway under the new four-track railbed to Franklin Park. At the intersection of Walk Hill Street and Washington Street, where the old Toll Gate House stood, the last bridge was built of plate girders just beyond the new brick Forest Hills Station. All of this was destroyed between 1981 and 1984 for the Southwest Corridor, which depressed the Orange Line and Amtrak rails and placed a park on the covered decks. Yet just as the Southwest Corridor transformed the topography of Forest Hills, the stone walls of the improved railroad changed the character of Forest Hills. At the turn of the century, Forest Hills would evolve quickly from country seats of the wealthy to thickly settled streets of multi-family houses for the working and middle classes . At Woodbourne, however, a different character would emerge. On August 26, 1896, the City of Boston took an acre of land from Andrew J. Peters for the construction of the Francis Parkman School. Charles B. Perkins designed the building which was built in stages between 1899 and 1904. Across Wachusett Street at the same time, the Forest Hills Methodist Church Society ‘s new building was going up on land donated by Peters in 1897. Forest Hills Methodist began in October, 1893 in a rented hall in Forest Hills. James G. Hutchinson designed the church in a half-timbered wood-and-stucco style of an English country church (with a “Shakespearean gable,” as the Boston Herald reported on April 24, 1899). The building permit was issued on June 10, 1899. At the corner of Wachusett and Patten Streets, Hutchinson designed a 75-foot high tower. It was a landmark for many years and Hutchinson would make his mark on Woodbourne on later buildings. The church was dedicated on October 27, 1901. The Herald trumpeted in its next day edition that “Forest Hills has a new house of worship.” The paper printed photographs of the new church showing its handsome tower and an interior view of the sanctuary. In 1925, an addition was added on Wachusett Street. On March 10, 1977, the Shawmut Chapter of the Knights of Columbus bought the church, which was in some disrepair. Shortly thereafter, blue aluminum siding buried the Shakespearean gable and everything else. In that way it is still a landmark building. The Boston Herald announced the transformation of the character of this section of Forest Hills in its Real Estate section on July 14, 1901: “Title taken to land on Patten, Walk Hill, Rodman, Eldridge and Hyde Park Avenue.” The trustees of the estate of Andrew J. Peters realized a profit from his investment in land thirty years earlier when they sold 16 acres to Hosford and Williams Real Estate Dealers, 337 Tremont Building. “A group of high grade building lots belonging to the late Andrew J. Peters and formerly known as the Richard Olney estate adjoins the estate of the late William Minot Esq. … This property is in one of the best sections of Jamaica Plain, a district that is growing rapidly” (Herald, May 8, 1904). The developers advertised the property as being but 3 minutes from Forest Hills Station, “where over 200 trains a day are available,” as well as the street cars. By 1904, Patten, Rodman and Eldridge Streets had been built and Wachusett Street extended to Eldridge. House lots ranged in price from $600 and up. Outside of the Catherine Street houses, the earliest house in the Woodbourne district is number 71 Walk Hill Street, built for Charles DeRoches. The building permit was issued on October 20, 1896. The handsome house with corner tower and projecting wall dormer windows was designed by a Mr. P. Corson. On December 31, 1896, a building permit was approved to build the two-family wooden house at number 17-19 Walk Hill Street for J. A.Tobin. George Zunner was the architect. In 1898, Tobin erected the brick apartment block number 9 to 13 next to it. W. J. Peters was the architect. Construction of houses on the lots sold by Hosford and Williams began in 1899 with number 55 Patten Street, a one-family house designed by James Murray. Murray also designed number 47 Patten Street in 1899 which, like number 55 Patten and 71 Walk Hill, were built by H. F. McNeal. On July 22, 1902, number 66 Patten Street was built. Alan Fraser was the architect and it cost $4,500 to build. Houses were not built as quickly as the excitement of the press suggested they would. Construction happened in spurts and in various architectural styles, mainly of two-family dwellings. Of the 21 houses on Patten Street between Wachusett and Bourne, only ten were built by 1914. Number 65 and 67 Patten at the corner of Rodman was built as late as 1928, 26 years after its neighbor, number 63, was completed. And the houses between Rodman and Bourne, numbers 81 and 85 Patten Street, were not built until 1964. Number 65 Patten was designed by Albin F. Brodin of Roslindale, one of the most prolific architects in the Woodbourne district (of the 254 houses surveyed for this history, 23 are by Brodin). The oldest building in the district is number 56, a large house in half-timber style set back from the street, which — as has been said — was Richard Olney’s house. It was enlarged and altered in 1921. Harold Peters owned it in 1914. That Richard Olney owned the house was still a point of pride as late as 1968 when the history of the neighborhood was written in a souvenir program from the 60th Reunion of St. Andrews Church. Harold Peters also built number 60 Patten Street next door. It was designed by Alexander Boyle (of Murdock and Boyle) and was completed on December 12, 1916 at a cost of $3,500. (Peters and Boyle also collaborated on number 169 Wachusett Street, also in 1916.) Another interesting building is the large two-family brick house with the dignified gallery at number 43 Patten Street, built in 1922 by HoratioYoung of Brighton. The other two brick buildings in the district are numbers 32 and 40 Eldridge Street. The building permits cannot be found. Number 32 was built by 1914, and number 40 by 1924. 63 Bourne St. is a Colonial Revival saltbox style and was built in 1922. One of a cluster of four houses built on its own lot at the same time when the Woodbourne development resumed after WWI. Walk Hill Street and Wachusett Street extension to Eldridge are more uniform in style and proportion than Patten, but even on those two streets, development took 20 years. The earliest house on Wachusett Street in the district is number 161 built in 1903; at the opposite end, number 210 was built in 1926. Number 71 Walk Hill Street was built, as we have seen, in 1896; number 51 was completed 36 years later on March 5, 1932. Numbers 51 and 55 Walk Hill Street were constructed 33 years apart. Not every building was built as a home. On May 10, 1907, number 87 Walk Hill Street was completed for Mary C. Davis as a showroom for cemetery monuments and headstones. It was replaced as a dwelling house in 1925. Arthur Weinbaum of Weinbaum & Wexler was the architect. Bourne Street began to be redeveloped in 1909 when Hiram Ludovic built number 9 Bourne Street. Samuel J. Rantin was the architect (Rantin also designed the 1907 Davis Monument showroom behind it.) One of the handsomest houses in the district is the corner building at number 15 Bourne Street, with its double-Dutch Colonial-style gambrel roof with the elbows connected by molding. Each roof faced a street. Robert J. McDonnell of Roxbury was the architect and it was completed in 1912. As an illustration of how house lots took decades to be built on in the top half of the district, the small white cottage at number 12 Bourne Street was not completed until 1931, over 20 years after its neighbor number 9 was built. Albin Brodin was the architect. In 1909, the same year that number 9 Bourne was built, the City of Boston built a brick-and-steel fire station at the corner of Walk Hill and Wenham Streets. It was designed by Moller and Smith and completed in May, 1910. It was converted to apartments in 1962. The heart of the Woodbourne District is the roughly oval-shaped area conforming to the flow of Northbourne, Wachusett, Florian and Southbourne Roads. This was the first phase of Forest Hills Cottages, a subdivision unlike any before it in Jamaica Plain because it was not built for profit so much as it was built as a statement of social reform, in many ways an experiment. What follows owes much to the original thought and research first of Richard Candee and Greer Hardwick, who began to study Woodbourne in the early 1980s, and most recently the work of Peter Rowe and Alexander Von Hoffman. The Minot family began to sell off their summer estate on August 28, 1899, when the Massachusetts Cremation Society paid $5,900 for 2 ¾ acres of land along Walk Hill Street (Suffolk: Book 2602, p. 420). This is now part of Forest Hills Cemetery. In 1906, the various Minot heirs and guardians planned to subdivide their property. This decision was no doubt encouraged by the determination of the Boston Elevated Company to extend the Washington Street Elevated from Dudley Square — where it terminated in 1901 — to Forest Hills. Ground was broken on March 16, 1908. Service from Forest Hills direct to the Washington Street tunnel and the downtown business and financial district opened on November 22, 1909. The elevated followed the route of the Metropolitan Railroad horsecars which began in 1853 from the corner of Bromfield and Tremont Street to Egleston Square along the line of the old Norfolk and Bristol Turnpike. It was extended to Forest Hills in 1864. Electric cars replaced horses on September 2, 1890. Forest Hills had been a transportation center since 1803 when it was called Toll Gate on the Norfolk and Bristol Turnpike. In 1909, it was the center of electric surface cars, the elevated rapid transit trains and the intercity steam railroad. The Boston Dwelling House Company hoped to attract as home buyers the motormen, mechanics and superintendents of the Boston Elevated operating out of the Arborway car barns. In contrast to Hosford and Williams, the trustees of Boston Dwelling House had an ideology: they would build quality housing for the working man. The Hosford and Williams subdivision of the Olney-Peters property was descended from the last of three significant patterns of housing for workers which grew up in the middle of the 19th century: the boarding house for the factory girls working, for example, in the Olney family’s cotton mill in Oxford; the company-owned and -built tenements such as those around the brewery on Amory Street; and the speculative building on large tracts around the outskirts of the factory districts of cities. In the late 1870s, speculative developers adapted the new, popular style of the triple decker: apartment houses of three family flats one on top of the other. Literally acres of triple deckers were built across fields of square grids, particularly in Dorchester. This is well-illustrated by the grid of streets coming off Washington Street at the edge of the car barns. Triple deckers line Brookley and Rossmore Roads, Williams and Forest Hills Streets, stopped by Franklin Park. [This writer lived for 18 years in a triple decker built in 1927 on Forest Hills Street. The owner was a retired electrician for the Boston Elevated; exactly the sort of working man who the Boston Dwelling House trustees wanted to attract. He rented in a triple decker for nearly 30 years.] On the edge of Woodbourne, the triple deckers began being built along Hyde Park Avenue from Walk Hill Street to Eldridge Road at the same time as the first houses of the Boston Dwelling House Company were underway. But these neighborhoods were congested, and many triple deckers were not well built. Poverty, blight and congestion were becoming of increasing concern to a new breed of men and women in the last years of the 19th century, that century of unprecedented urban growth. Working-class apartment dwellers were seen by reform planners at the turn of the century as rootless and not involved or invested in the community. Home ownership was the key to build civic pride and stability in a time of enormous growth and great technological change. Home ownership was also seen as the way to warm up the melting pot — to hasten the assimilation of the immigrants from Eastern Europe into the American way. At the turn of the century, some progressive industrialists and architects began to work on the concept of integrating housing with aesthetics and landscape design in industrial communities, taking Andrew Jackson Downing’s theory of landscaping private homes to more egalitarian — and hence more American — directions. But mill and factory owners and other barons of commerce still wanted to keep their profits high, and they were not inclined to increase wages, so the dream of home ownership was beyond the reach of the workers in the factories which lined the Stony Brook Valley of Roxbury and Jamaica Plain. The development proposed by Boston Dwelling House would be based on the Garden City concepts developing in Britain and the United States by social reformers. The Garden City centered on the suburban plan of houses integrated into the landscape with emphasis on the natural features of the site. The site would be outside the central business and industrial sections of the city but connected to it by rail. The Garden City would be profitable, but could keep costs down by the collective purchase of a large site and design and construction of houses based on a master plan of shared spaces. The village atmosphere (to use a term of Candee and Hardwick) not only reduced costs, it kept closely to the ideology of the Garden City. “[It ] was deemed important to civic and moral health because it would evoke a complex of middle class values — home ownership, saving, civic pride and citizenship… Reformers believed their projects would nurture traditional American values and strengthen the democratic system” (Candee and Hardwick). Forest Hills Cottages is also close to the ideals of philanthropic housing pioneered by the British in the 1870s. Rowe and Von Hoffman make this connection: private philanthropy directed by men of wealth and influence would provide good and affordable housing where the private sector was timid to invest. Forty years before the Woodbourne experiment, the Boston Cooperative Building Company attempted a very similar project to build a suburban neighborhood of single family houses affordable to the workingman. Indeed, the two housing initiatives overlapped in the person of settlement-house reformer Robert A. Woods: he joined the board of Boston Cooperative in 1896; in 1911 he became a trustee of the Boston Dwelling House Company. Called “the first significant model housing company in the United States” by scholar David Culver, the Boston Cooperative Building Company was chartered in May of 1871 to provide houses for working people at moderate cost. Boston Cooperative grew out of the tenement reform movement which gained increasing energy after the Civil War when a massive increase in immigration caused great overcrowding in rundown multi-family buildings in central Boston’s waterfront and factory districts. The Cooperative was formed by the distinguished physician Henry Ingersoll Bowditch, a pioneer in public health in Massachusetts. Out of his efforts came the first Board of Health in the Commonwealth in 1869, which he chaired for ten years. In the years between the Civil War and as late as the 1890s, poor housing was considered specifically a public health matter. Bowditch had become interested in housing as early as the 1840s when large numbers of impoverished Irish immigrants first began to strain Boston’s limited housing stock. His thinking was greatly influenced by English housing reformers. Shortly after assuming the chair of the State Board of Health, Bowditch spent six months in London where he met with housing reformers, toured slums and visited model tenements. Chief among reformers was the wealthy financier, Sir Sidney Waterlow. In 1863 using his own wealth, Waterlow created the Industrial Dwelling Company to provide housing for London’s poor. Bowditch met Waterlow, toured his model apartment buildings and talked with the tenants. Bowditch came away a believer that Waterlow’s system could be duplicated in Boston to solve the city’s housing problems. The only way to provide better housing for the working poor was to provide alternatives to the real estate market which controlled the supply of, and the rentals and prices for, housing. Bowditch convened a number of wealthy friends who together raised a capital of $200,000 to form the Boston Cooperative Building Company. Each investor would be limited to a return of only 7 percent (about half of what tenement investors were getting). The Board was an impressive one: Martin Brimmer was President, a seat he held for 24 years until his death in 1896. Board members were Bowditch; the Hyde Park industrialist Henry C. Grew; Robert Treat Paine Jr., himself a housing philanthropist; Mary E. Parkman, sister of the great historian Francis Parkman; the architect George W. Pope; and future governor Roger Wolcott. Suburban housing for the workingman remained a popular notion among reform housing advocates despite the fact that it was unrealistic. Workingmen were not commuters (Culver). They lived near to where they worked because transportation costs were high, and reformers could not get the railroad Boards of Directors to provide workingman’s fares. Boston Cooperative Housing trustees were fervent disciples of suburban living for workingmen. In 1872, as the East Canton Street row houses were being rented, the BCBC trustees formed a Standing Committee on Country Houses which included two women (no doubt to advise on moralistic issues as well as the needs of the housewife), Abby May and Helen F Kendall, the architect George Pope, Henry Grew and J. Gardener White. • Reasonable land costs per square foot. On March 12,1874, the Boston Cooperative Building Company bought a ten-acre lot for $31,750 from the estate of Samuel Blake Pierce on Harvard Street in the then recently-annexed town of Dorchester. The flat parcel was two blocks from the Harvard Station of the Hartford and Erie (today the Midlands Branch) Railroad and equally close by was a public school. In the summer of 1874, two streets were laid out and 13 houses built, no doubt designed by George W. Pope (who, it can be assumed, also designed the East Canton row houses). The streets were named Sidney Place and Waterlow Street after the English housing reformer. Waterlow Street curves from one point on Harvard Street to another. The BCBC trustees sold the Harvard Street lots for market value. (Waterlow Street still exists; Sidney Place is today Elmont Street which runs perpendicular from Waterlow to Vassar Street; a third road named Clinton Street was laid out in 1897 after BCBC had sold off the remaining lots.) In total, 16 houses were built by 1876. They were roomy, gable-fronted wooden houses with 2 to 4 bedrooms, a kitchen and a cellar. The average price was $2,650. The homebuyer had to deposit a downpayment of $200 and paid $25 monthly. Not until the full purchase price was paid would the homebuyer receive the deed to the house and lot. Yet despite the best efforts of the Boston Cooperative Building Company, the homes were beyond the wage level of the workingman or laborer; as happened at Woodbourne, the very class of people for whom the housing was built could not afford them. The timing also could not have been worse: like building a tree house in a hurricane, the Sidney Place and Waterlow Street houses were constructed during the worst depression America had then suffered; it began in 1873 and lasted throughout the decade. Many men who paid the downpayment could not keep up on the rest of the debt and BCBC ended up being landlord mainly to renters. The Sidney-Waterlow model housing was a financial as well as a reform failure. There were not enough workers, writes Culver, who could afford enough suburban housing to make it successful. Boston Cooperative ended up selling houselots on the open market exactly as Boston Dwelling House Company did at Woodbourne after 1922. By 1896, all the land had been sold and BCBC closed its books on the first philanthropic single-family housing development in Boston. Yet by 1902, as Cousineau notes, over 30 years and two major economic depressions, Boston Cooperative Building Company had built or rehabilitated 311 family housing units in 78 houses ranging from single family to small tenement — a proud record. Only Waterlow and Elmont Street survive today, although it is difficult to determine exactly which houses were built by the Cooperative. Despite this failure, housing reformers were convinced that private enterprise was the best hope for the housing problem. At no time, writes Culver, did the trustees of the Boston Cooperative Housing even hint in their annual reports that perhaps the free enterprise system was not adequate to the task. That realization was still sixty years in the future. Boston Cooperative trustee Robert Treat Paine Jr. remained convinced that private capital and philanthropy could solve the housing problem and he still believed in suburban relocation of workingmen. By 1885, he had built 45 small brick row houses for workingmen on Sussex Street in Lower Roxbury. In 1887, at the opposite end of Jamaica Plain from Woodbourne, Paine organized the Workingman’s Building Association, a division of his Workingman’s Cooperative Bank. In 1888, he bought up a large tract below Center Street in the shadows of the Plant Shoe factory and the large breweries on Heath Street, and the Workingman’s Building Association erected 116 model single-family homes between 1889 and 1891 on the picturesquely named Sunnyside and Roundhill Streets. They were modest Queen-Anne style houses designed by George Pope. A bit more attractive in embellishments than Waterlow Street, all were sold as soon as they were completed. The location was ideal: within walking distance of several large factories, and the construction also took place during a period of robust economic growth. Yet despite Paine’s best efforts, the housing remained too expensive for the laboring class. The higher-paid skilled workman and middle manager bought the model homes. The workers moved their families into the miles of wooden triple deckers which dotted the hills around the factories; this was ironic because Sunnyside was a direct alternative to the triple decker and the tenement block, another major objective of housing reformers. The suburban model housing of Sunnyside and Sidney-Waterlow represented the ideal form of philanthropic workingmen’s’ housing which the Boston Dwelling House Company would seek to emulate. The precedent of Sidney-Waterlow model housing was the parent of the Woodbourne garden suburb. Like the Boston Cooperative Building Company, the Boston Dwelling House Company was organized by men and women of wealth, position and influence. As they made clear in their investment prospectus, they were involved “to point the way to home ownership for persons of limited income not in the spirit of charity, but in the spirit of good citizenship.” Seventeen officers and trustees were listed on the investment pamphlet distributed in 1912. The company’s president was Henry Howard, a leader of the Boston Chamber of Commerce and vice president of a Massachusetts Chemical Company. The social reformer Robert A. Woods, renowned for his work on the problems and solutions of the tenement district poor (which were the concern of the North End Mission) was a trustee, together with His Eminence William Cardinal O’Connell, the Archbishop of Boston. Edward A. Filene, the owner of one of Boston’s largest department stores, was a leader in the progressive movement in Boston to reform and improve many aspects of its society, but particularly overcrowded and substandard housing. The great Cardinal was a “militant defender of Catholic interests,” but he could not be described as a social “do gooder.” Filene convinced Cardinal O’Connell that many a good Catholic lived in run-down housing owned by careless landlords, and in 1910, Cardinal O’Connell briefly joined the Boston Dwelling House movement (Rowe and Von Hoffman). The most active trustee of Boston Dwelling House was its vice president, Robert Winsor Jr., one of the Directors of the Boston Elevated Company. He was the one who suggested in 1911 that a model residential suburb be built near the Forest Hills car barns for conductors and motormen. Winsor studied the garden cities of England and was particularly impressed with Forest Hills Gardens, then under construction in the borough of Queens, New York City. Underwritten by the Russell Sage Foundation, Forest Hills in Queens was the next-higher level of philanthropic housing as built by men like Paine. It had the same goals as Boston Dwelling House: it was intended to be affordable for the middle class working man. The Olmsted Brothers were the landscape architects and Grosvenor Atterbury the architect. In 1869, the Olmsted firm, headed by Frederick Law Olmsted and his partner Calvert Vaux, had designed one of the first railroad suburbs in America on the prairie outside Chicago called Riverside. F. L. Olmsted died in 1903, and since then the firm had been headed by his son Fred Jr. and step-son John Charles. The brothers were retained by Boston Dwelling House early in 1911. So as to keep their project distinct from the Sage Foundation’s, they called their subdivision “Woodbourne”. The Olmsted firm presented its first plan to the Dwelling House Company in April, 1911. It borrowed a lot from Riverside, Illinois, particularly with thickly planted curvilinear streets coming off a straight axis. A wide triangular space in the middle of the site was proposed at which present-day Bournedale, Northbourne, Bourne and a fourth street would meet at a rotary. Two important Boston architectural firms were selected by Olmsted to work on the project: Parker, Thomas & Rice and Kilham & Hopkins. Grosvenor Atterbury was also asked to prepare plans. The report went on to state that 13 contractors had been asked to bid on the project and their estimates ranged from $150,000 to $160,000 for house-lot preparation, streets and drainage. Pope proposed to build 127 single and double houses for 163 families on 17 acres for a total cost of $39,293.38 He stated that a house lot measuring 3,900 square feet could be sold for $1000. That cost would include parks, playgrounds and service roads. When Howard engaged Pope to redesign the project, Frederick Law and John Charles Olmsted were furious at what they felt was breach of contract and withdrew all their plans (Candee and Hardwick). The shape of the Woodbourne garden suburb today is the design of Robert Anderson Pope. Three new streets were planned and graded out: Northbourne Road, Westbourne Road and Westbourne Terrace. Westbourne Road was the extension of Wachusett Street which, to avoid Stony Brook, did not connect up to Wyvern, but instead curved around an oval to meet Florence (now Florian) Street. A road was built from Hyde Park Avenue to meet Florence Street. The new road was joined with the stretch of Florence Street coming off Bourne Street and renamed Southbourne. Northbourne followed the curve of the steepest slope of the ridge on which the Minots built their summer houses and connected Bourne with Hyde Park Avenue. The highest part of the development was Westbourne Terrace — later renamed Bournedale Road. It followed approximately the line of the original approach drives to the Minot houses on the crest of the ridge. At the highest point, Pope had planned two small, diamond-shaped parks in the center of the road around which homes would be built. In the second phase of construction after 1922, this street pattern was wisely rebuilt. The small parks are still suggested by the setbacks of number 26, 30, 32 and 34 Bournedale Road. Number 14 and 24 Bourndale. Colonial Revival saltbox style. Built 1922 and 1923. Pope planned Woodbourne with three distinct housing patterns built over about 17 acres. The first was two groups of brick houses set in a common park on the southern slope of the wooded ridge of the Minot houses. These groups had twelve houses each facing out across a wide common on Southbourne Road. Each group had one six-family attached block set far back on the lot, two double houses and two single-family houses on each side. The were tied together by a common service driveway and each had a common playground space. A smaller court at the eastern end of Southbourne near Bourne Street consisted of one two family attached house flanked by two single family houses all built of wood and stucco. The second housing pattern was a cluster of ten two-story cottages of wood and stucco built around common land in an oval created by Wachusett and Florian Streets. They all faced inward towards the center of the oval, not out at the busy street. This was one way to compensate for the compactness of the lot. These houses were meant for the lower-income home owner; they cost $3,500 to build. The third pattern was a block of six apartment houses built along Hyde Park Avenue between the two entrance drives of Northbourne and Southbourne Roads. These were built as a wall to block out Hyde Park Avenue’s traffic and street-car noises from the cottages within the development. They were very distinctly-designed buildings suggested by Henry Howard as an alternative to the triple decker which was beginning its march down Hyde Park Avenue from Walk Hill Street. Actually, they were just four triple deckers placed back-to-back with one common entrance. Built of wood and light-colored stucco, they had broad piazzas facing Hyde Park Avenue and a common courtyard on the interior. The apartment blocks were built in a sweeping bow front at the corners of Northbourne and Southbourne Roads. Although only made of wood, they were very distinguished buildings and the finest block of buildings on the Avenue until West Street. Their commanding size and light color caused the neighborhood to be called “White City.” By the time they were completed, the bank of triple deckers which dominates the west side of Hyde Park Avenue was well underway: six were completed by 1914 and sixteen by 1924, between Walk Hill Street and Eldridge Road. Allowed to deteriorate by their owner, the White City apartments were razed in 1977 and replaced by the present block of low-scale dark-wood-and-brick apartments named Woodbourne, which hug their lots so tentatively as to be almost invisible. The architect for three of the four housing clusters was the firm of Kilham and Hopkins, formed in 1901. Most of their work was in the design of public schools and urban apartment blocks, as well as Colonial-Revival homes for Boston’s upper-middle class (Candee and Hardwick). The principles of the firm were Walter H. Kilham of Beverly (1868-1948 ) and James Cleveland Hopkins (1873-1938), who grew up in Jamaica Plain. Both men graduated from MIT. Hopkins, as Candee and Hardwick point out, “spent part of each year in England and this influenced his taste for half timbered, arts and crafts houses.” He was the most informed on English garden city developments (Candee and Hardwick). The prize of Woodbourne are the two groups of brick houses on Southbourne Road. In keeping with the ideals of the garden suburb, each house has its own garden plot and a common playground for children and each group was carefully integrated into the landscape. “The greatest care has been taken to preserve the wonderful old trees that occupied the ground before the buildings were started. Most of these trees have been preserved and give the whole community the age and dignity which is only obtained after years of patient waiting.” [William Minot Jr. would have been pleased.] In addition, the common areas were planted with shrubs and trees, and vines were grown against the brick walls of each house. The large oval of smaller wooden cottages were designed by Kilham and Hopkins in half-timbered, stucco style in imitation of the English Arts and Crafts house which James Hopkins so much admired. The lots were quite modest, even for 1911: only about 800 square feet. Like the Southbourne groups, each house features a prominent double-hip slate roof and shares a common pedestrian walk to each doorway. The Florian ( Florence) Street cluster illustrates the design philosophy of Robert Anderson Pope, in which he explained that tribal property was an advancement over individual property. Pope was also a believer in self sufficiency and he recommended that garden space be provided so that each family could have fresh vegetables (Rowe and Von Hoffman). The Florian Street clusters were deliberately designed for the lower-middle-class home owner, so the communal space also reduced the costs for utility lines and pipes. Kilham and Hopkins designed the apartment houses on Hyde Park Avenue which they described as a “new type of low cost apartment house which have met and conquered the triple decker on its own ground.” The Boston Sunday Herald of March 17, 1912 devoted a whole page to these apartment buildings, including line drawings of the front and rear elevations. The group of small cottages at the east end of Southbourne were designed for newly-weds just beginning a family by the architectural firm of Allen and Collens. Francis R. Allen, the senior partner, joined with Charles Collens in 1903 to form a design team which for 30 years gained a national reputation as architects of Gothic style churches and institutional buildings. Among their greatest accomplishments was Riverside Church in upper Manhattan which was built in 1930. They designed the Newton City Hall in 1932. The small cottages appear to be a speculative venture of Charles. He is listed as the owner of each of the 4 properties on the building permuted dated June 21, 1912. They were completed on January 31, 1913. Each shares a common lawn and the center two-family house is set back from the street nestled in trees. In 1911, the Dwelling House Company opened its site office at 308 Hyde Park Avenue near the corner of Southbourne Road. Unlike the Hosford and Williams development, Boston Dwelling House bought, built and marketed their project. Work began on the two brick groups on Southbourne Road on November 11, 1911 when the building permits were issued for number 40, 42, 38, 36 and 30. The A. Varnerin Company was the contractor and the buildings were completed on October 5, 1912. In the early weeks of 1912, Varnerin’s crews began construction of the Hyde Park Avenue apartment buildings. On June 24, 1912, building permits were issued for the Florian Street homes. J. N. Fish and Company were the contractors and they completed the houses on April 11, 1913. By the end of 1914, 38 homes had been built and 72 apartments in six buildings completed. This included a clubhouse for the Woodbourne Club designed by Allen and Collens at 84 Bourne Street. This was built on a half acre of land at the corner of Bourne, Southbourne and what would become Eastland Street by the Boston Dwelling House Company as an amenity for the owners of their houses, and the club was part of the promotion the company used to sell houses. The clubhouse is noted for its huge rubblestone fireplace. Construction costs for each single-family building ranged from $4,800 to $5,400. All had been bought and rented. The publicity was very favorable; the Herald trumpeted Woodbourne regularly: “Engaged and newly married couples should visit” (April 18, 1913). “Visit Woodbourne on the 4th of July, the most attractive harmonious and artistic community of homes around Boston (July 3, 1913). “48 Southbourne Road sold to Mrs. L. M. Clark. Furnished throughout by Jordan Marsh Company (Sunday Herald, July 6, 1913). World War I intervened and then a recession. It was not until 1920-1921, that the Boston Dwelling House Company (BDH Co.) began to develop the rest of its property at Woodbourne. Now, though, the ideologically-driven, reform-minded company was replaced by a simple real estate venture. “The compulsion for idealism was gone,” wrote Frederick Lewis Allen in Only Yesterday (1931), “realism was in the ascendant.” Although BDH Co. didn’t loose money in the first phase and all the homes were purchased, it didn’t earn as much as the Directors hoped either. More importantly, the lower-middle classes — the motormen and conductors of the Boston Elevated — couldn’t afford the houses. The high quality of workmanship in the brick houses with fireplaces, built-in book-shelves and sunporches, were too expensive for the very group for whom they were built in the first place. So the motormen, carpenters, mailmen and skilled brewery workers took apartments on Walk Hill Street, the low numbers of Wachusett Street, as well as Weld Hill and Tower Streets. As Rowe and Von Hoffman point out, 70% of the residents of Woodbourne were middle-level managers, salesmen, teachers, dentists and doctors. Some domestic servants of the families on Southbourne Road lived in the apartments on Hyde Park Avenue. The objective for profit which the trustees of BDH Co. stated from the start, ironically, foiled their honest attempt to make home ownership affordable to an emerging middle class. As Rowe and Von Hoffman write, this fact demonstrated that the private sector could not provide good, affordable housing for the lower-middle-class and working-class families — much less home ownership. The Depression would make this fact a stark reality and out of this came the United States Housing Act of 1937, which stated that for the first time in American history it was the policy of the United States to remedy unsafe and unsanitary housing. The second phase of the development of Woodbourne lasted from 1922 until 1933. On August 1, 1922, Boston Dwelling House completed a measured plan for house lots on the land they owned on Bournedale and Northbourne Roads. Twenty-one houses were plotted for the north side of Bournedale and the south side (with its steep slope) of Northbourne. The north side — where the Seaver School would soon be built — was laid out with eight house lots. On July 23, 1923, a subdivision plan of all the land between Bourne Street and St. Michael’s Cemetery was prepared showing 96 house lots on streets named Eastland, Woodbourne and Waybourne Roads. Unlike the first romantic era, these houses were set on their own lots parallel to the street. Like the Hosford and Williams subdivision, these house lots averaged 5000 square feet and were sold to individuals, contractors or speculators, although, between 1922 and 1925, Boston Dwelling House itself planned, built and marketed homes. The second phase does not have any pattern to it; gone are the cluster courts and common parkland. The concept of tribal land which so impressed Robert Anderson Pope was at odds with the single-most-important pillar of American culture, the individual. Americans preferred there own houses on their own lots. Yet all the houses have a comfortable, familiar feel to them. All are based on the lines of the New England wooden house of the 17th and 18th century. The Colonial Revival style first bloomed at the 1893 World’s Columbian Exhibition in Chicago when visitors saw the Massachusetts State Building, a reproduction of John Hancock’s 18th-century Beacon Hill mansion (a close copy of which can be seen at number 23 Eliot Street, Jamaica Plain). Housing reform advocates proffered the Colonial style because it was egalitarian, solid and respectable (Candee and Hardwick). The architects for the wealthy built their mansions in the Roaring Twenties, borrowing from England and Italy or France. The middle classes felt more comfortable in a decidedly American form of architecture. The use of Colonial Revival styles throughout most of phase two of Woodbourne, especially along Bourne Street as far as Goodway Road and all of Bournedale, make this section very different from the Hosford and Williams development of Patten and Walk Hill Streets. This unified streetscape of architectural style and proportion begins to fray past Goodway Road as multiple family houses were built. Number 90, 92 and 94 Bourne Street are interesting variations on the Colonial Style. Number 92, built in 1926, has a gambrel roof with the end wall set perpendicular to the street. Number 90 and 94 were built in 1925 by BDH Co. They were each designed by James G. Hutchinson who incorporated a hip roof and a shed roof to the street facade. Each shed roof has a different twist to it; number 90 has long narrow clerestory windows and number 94 has an asymmetrical pedimented entrance. Boston Dwelling House built and marketed the first houses in 1922 beginning where they left off in 1914 at the east end of Southbourne Road. These were the closest to a cluster pattern that would be seen in the second phase, a set of houses all designed in the same style on Bourne Street between Southbourne and Bourndale Roads. Numbers 59 and 63 were begun in April, 1922 and were designed by James G. Hutchinson, the architect of Forest Hills Methodist Church in 1899 and number 65 Walk Hill Street in 1902. Hutchinson designed 16 houses in Woodbourne for both Hosford and Williams and Boston Dwelling House. Numbers 55 and 49 followed in July, 1922, designed by Woodbury and Stuart, also in the same style. Before joining with George Stuart in 1918, Daniel Woodbury was in private practice starting in 1893. In 1907, he designed number 80 Patten Street. Brick cluster housing set on commonly owned parkland. Number 56, 58, 60-70, Southbourne Rd. Built 1912. The style that Hutchinson and Woodbury and Stuart used was a derivation of the saltbox or catslide roof common in 17th-century New England farmhouses, where one roof slope is longer than the other. In the original, the entrance is set in the center of the shorter slope. In the Bourne Street group, the front has been turned to the end wall and the entrance placed asymmetrically at the shortest slope. There are ten houses built in the Woodbourne Saltbox style, four in a row on Bournedale, number 10 Southbourne and number 49 Bourndale. The latter are each set at an angle on a corner lot. Number 10 Southbourne was begun in July, 1922 by Boston Dwellling House next to one of the 1912 corner apartment buildings. It was designed by Woodbury and Stuart and cost $7000 to build. (By contrast, the cottage nearby at number 288 Wachusett Street designed by Kilham and Hopkins in 1912, cost half that to build.) Directly opposite, the house set high above the street at number 18 Southbourne was also begun in April, 1922 but not by the Dwelling House Company. The lot was acquired by Hartwell Sibley who hired Woodbury and Stuart to design it in a modified Federal style with a Greek Revival entrance. Bournedale Road the most architecturally uniform street in the second phase. It occupies the highest elevation in the district; all three Minot houses were built facing south at its crest. Every house but three were built in the four-year period 1922-1926. Number 41, built on the site of William Minot Sr.’s summer house, was designed by James G. Hutchinson for Clarence Trimble. The building permit was issued on Sept. 17, 1926. All the houses are built in Colonial Revival styles — three with gambrel roofs and four in Woodbourne saltbox style. Number 9 is different. It is an L-shaped house built close to the street on a long narrow lot. It has a sloping, bungalow-style roof facing southwesterly. Number 5 Bournedale was first for about seven years the site of the construction yard for the Dwelling House Company, beginning in 1924. In May, 1937, a permit was issued for a single-family house designed by Joseph Selwyn using the 17th-century house style of a projected second story called a jetty, or the garrison style. Also in 1937, number 11 Southbourne was built from designs of Harold Duffie. The earliest houses on Bourne Street are two multi-family houses which date from before 1890 at numbers 149 and 145, probably built by Organ and Meyer about 1888 or 1889.s Thirty-one houses were built on BDH Co land along Bourne Street between 1923 and 1933. In 1924, Pierrre O. Plant designed and built a cottage at number 11 Bourne Street, this was the last house on the former Olney property on Bourne Street. In May and October, 1923, construction began on number 35 and 32 Bourne Street by BDH Co. These were both designed by Mulhall and Holmes in wood and stucco. They are both the same house, except that number 32 is set sideways on the highest lot on the street. It is distinguished by a wooden gallery built around a central brick chimney which is its street face. Number 6 Bourndale, also built in 1923 at the corner of Wachusett, is a duplicate of those two houses. Building houses or selling house lots for the single-family home owner was, like the golden first phase of Woodbourne, the dominant theme of the second phase. But this phase was marked by profit over ideology. The hated triple-decker was kept out (although two did sneak in on the periphery of the property), but the two-family house was introduced, yet designed in a way that made it appear like a single-family building with one main door. The first was at number 16-18 Bourne Street, designed by James G. Hutchinson for the Dwelling House Company. Fred R. Wells was the contractor. Wells built many houses in the second phase for BDH Co, including 25 Bourne which Hutchinson designed in 1925. (Numbers 26, 32 and 35 Bourne were all built by Wells Company in 1923.) The largest house on Bourne Street is on the opposite corner from numbers 16-18, that is number 21 at the corner of Patten. Albin Brodin designed this two family for Nellie V. Cronin in 1929. Nellie lived at 101 Wachusett Street and she was issued the building permit on May 6, 1929. Other two-family houses on Bourne Street are number 98s-100 (1927), 102-104 (1926), and 106-108 (1926) all developed by Stanley Reid. Hutchinson designed numbers 98-100; Weinbaum and Wexler were the architects for the other two. (Weinbaum and Wexler designed the Mattapan Hebrew School on Morton and Norfolk Streets in 1930.) Three undisguised two-family houses — one apartment built on top of the other, with top and bottom porches facing the street — are opposite, numbers 87, 91 and 95 Bourne Street. These were each designed by Weinbaum and Wexler and they were built in 1927. The other two-family house on Dwelling House Company land is number 309 Wachusett, built in 1927 opposite number 302, one of the cottages designed by Kilham and Hopkins. The original Pope design of 1912, which The Brickbuilder reproduced in its April, 1913 issue, shows a series of four duplex houses set in large common areas, on the outside curve of Wachusett, from Florian and Southbourne streets. Only number 309 was built, suggesting again that it was profit over design and ideology which motivated the second phase of the Dwelling House Company. The first bungalow style house in the district is number 175 Wachusett Street completed on June 18, 1907. It was designed by C. L. Wetmore. It has twin oversized pedimented shed dormers on a sloping roof. The next house in this style didn’t get completed 17 years later. This is number 259 Wachusett Street, a classic bungalow-style house which Dorr, Harlow and Kimball designed for the Dwelling House Company. The building permit was issued on April 23, 1924. This style, however attractive, did not fit in with the Colonial-Revival pattern of the community and only one other bungalow-style house was built, at 20 Bourne Street. The house was completed on March 26, 1932. Walter Campbell was the architect. In 1932 and 1933, in the very last days of the Boston Dwelling House Company experiment, Albin Brodin designed three houses for Olva Auclair, 50 Northbourne Road (permit issued on November 29, 1932) and 42 and 46 Bourne Street (permits dated Sept. 8, 1933 and November 1, 1933). These were each designed with steeply-pitched roofs in what can be called Forest Hills Gothic. Number 50 Northbourne is the finest example of the style of which Brodin only designed these three in Woodbourne. Number 50 takes advantage of its slight elevation in the road with full-blown Gothic roof lines on front and south side elevations. Two views of 50 Northbourne, Tudor Revival style, built in 1932. In 1924, three neighborhood landmarks were completed. The first was a school, the Edwin P. Seaver School at 35 Eldridge Street. The City of Boston bought several parcels of land totaling a little over 2.5 acres from Boston Dwelling House and another private owner between Eldridge and Northbourne. The City leveled the lot by cutting into the slope along Northbourne below which it built a concrete retaining wall. Blackall, Clapp and Whittemore were the designers. In 1930, John F. Cullen either remodeled or completely redesigned the school in the Georgian Revival style on site today. The main building was completed in October, 1930; the two wings were added a year later. The school was named for Edwin P. Seaver (1835-1917) who was appointed headmaster of English High School in 1874 before serving as Superintendent of the Boston Public Schools for 24 years — 1880 until 1904. The other public investment was the Parkman Playground on Wachusett Street. On September 4, 1924, the Boston Parks Department paid $12,000 for 2 acres of land at the crest of the street. Once owned by Forest Hills Cemetery, the City bought the land from the Franciscan Monastery of St. Clare (Suffolk: Book 4612, p. 443). Preliminary work began that fall to grade the land into a level playing field. By the end of 1925, one baseball field, a skating pond, shelter and flagpole were built at a cost of $13,012. Skating began in December of 1926. The third landmark was St. Andrew the Apostle Church. It was dedicated with a Low Mass on May 11, 1924, Mother’s Day, by His Eminence William Cardinal O’Connell, one of the former Directors of the Boston Dwelling House Company. The Catholic Church has had a presence in the community since the Minot family built their summer houses. The first Catholic Church in Roxbury was St. Joseph’s Church dedicated on December 6, 1846. The parish included all of Roxbury, Dorchester, Brookline, Hyde Park, Dedham and Norwood. Reverend Patrick O’Bierne was the founder of the parish and he served it for the next 40 years. On May 9, 1849, Rev. O’Bierne bought a triangular parcel of land formerly owned by the Weld family just outside Toll Gate for the parish cemetery. The land cost $4,400 (including a $2,615 mortgage. Norfolk: Book 186, p. 310.). The cemetery was built on what was then known as Walk Hill Street, which became Hyde Park Avenue in 1869. The first internment was in 1854. The last internment was on June 15, 1897. It became the property of the Archdiocese in 1872, shortly before St. Thomas Church was dedicated on August 17, 1873. St. Thomas Parish included the Forest Hills district. In 1911, the New York, New Haven and Hartford Railroad proposed to take the cemetery for right-of-way expansion. At the request of the corporation, the Archdiocese investigated the history of the tiny cemetery. At that time it was in decrepit condition, with no parish claiming any responsibility for it. The Archdiocese found there were 300 headstones, of which only about 200 were legible. Apparently because the next-of-kin could not be located to authorize rebuttal of the graves, the railroad dropped its plan to take Toll Gate Cemetery. On March 31, 1916, The Roman Catholic Archbishop of Boston bought a 1 ¼-acre parcel at the corner of Walk Hill and Wachusett known as Clark’s Dairy Farm, from the heirs of Nicholas Summers. (Suffolk: Book 3946, p. 252). Nicholas and Sarah Summers bought the land from Joseph M. [Minot?] Weld on June 15, 1847. Joseph Minot owned all the land east of Toll Gate up to the edge of Forest Hills Cemetery, including present-day Tower and Walk Hill Streets. Until money could be raised for the new church, mass was held at Minton Hall in Forest Hills Square by the first pastor, Rev. William J. Casey. The first rectory was at 27A Asticou Road and later 76 Hyde Park Avenue. Father Casey proposed three names for the new church to Cardinal O’Connell: St. Henry, St. Catherine and St. Andrew (in that order; letter dated Sept. 4, 1918, Archdiocese Archives). The architect of St. Andrew the Apostle Church (named so as not to confuse it with St. Andrew’s Methodist Church in Egleston Square), was Richard Shaw,and his plans and cost estimates were submitted to the Archdiocese Building Commission in January, 1921. Final approval came on August 4, 1921 with an estimated cost of $65,000 for a stone church designed in the English Gothic style with a corner tower. It was decided at the same time that rather than build a new rectory, the old Summers house, built by Nicholas Summers about 1873, would be moved to a different location on the same site. Vandals had stripped the house of plumbing, doors, shelves and railings, and the windows were broken, but it was far cheaper to move the house than build a new one. The building permit to set the house on a new rubble-stone foundation was issued on Sept. 20, 1921. Once that was accomplished the new church could get underway, because its foundation is located where the house stood. A strike of stone cutters in Sept., 1922 delayed the finishing of the altar as well as the cornerstone ceremony (which apparently never happened). The architect of St. Andrews Church was also the original architect for the West Roxbury Courthouse. Richard Shaw presented the keys to the new courthouse to Mayor James M. Curley in June, 1923 (Herald, June 3, 1923). The courthouse is in Georgian Revival style in tan Roman brick. At St. Andrews he used the English Gothic style with a broad flat front with low relief decoration facing Walk Hill Street. Shaw used small, evenly-cut, multi-colored granite which created a mosaic on the building facades. Its most unique feature was the tower set into the corner of the sanctuary and the chapel. The St. Mary’s Chapel was completed in the base of the tower in 1928 together with the interior of the church. The church suffered from poor stone workmanship from its earliest days and this contributed to the weakening of the tower and spire. They were removed in the summer of 1978 (building permit issued June 22, 1978). A second lot of land was acquired opposite the church for a community building. This was erected as an undistinguished prefabricated structure of one story by Brooks, Skinner and Co., which was responsible for many garages added to houses in Woodbourne. The community building was completed on May 7, 1924 and used as a Sunday School. It was enlarged in 1931. A school was contemplated by the second parish priest, Rev. Patrick Durcan, in 1937. When the small filling station built in 1923 at the corner of Hyde Park Avenue and Walk Hill Street became available, Monsignor Phelan, the Archdiocese Chancellor wrote to Rev. Durcan to ask if it could be acquired by St. Andrew’s. In his reply of August 9, 1937, Father Durcan wrote, “It is too far from the church [and] is useless to us as church property. The only interest we might have is that these lots not be bought by Jews” (Letters, St. Andrews Church, Archdiocese Archives). The good father soon rested easy. The Shell Oil Company bought the parcel and erected a larger gas station and repair garage in 1940 (permit June 10, 1940). The gas station became Doughboy Donuts about 1980, and is now Dunkin Donuts. On October 27, 1937, Father Durcan submitted plans for the new school designed by Richard Shaw and estimated to cost $80,000. Construction was delayed until funds were in hand. The building permit for a 12-room school was issued on August 13, 1941. The site chosen was on Wachusett Street against the church. Some Roxbury conglomerate ledge had to be blasted for the foundation, which no doubt weakened the tower a little more. St. Andrew’s School officially opened on September 10, 1942 with 43 children. Richard Shaw also planned and executed the frescoes behind the altar of the church in 1937-1938, which Father Durcan paid for himself. St. Andrew’s rectory was the first of three homes moved from another location into the district. The second was number 235 Wachusett Street. This was a triple-decker built before 1914 at number 135 Hyde park Avenue. It was moved to make way for the Boston Elevated Carbarns. It was set on a new foundation on April 15, 1922, right at the property line of the Boston Dwelling House Company. The only other triple-decker in the district is number 211 Wachusett Street, built in 1923. Henry Bradley was the architect. The tree house lots which separate the two houses have never been built on in Roxbury history. The third house is number 121 Walk Hill Street. This was moved from number 205 Walk Hill Street to make way for the expansion of St. Michael’s Cemetery. The house was built about 1873, and was set on its new foundation on February 25, 1939. The Boston North End Mission Home property was purchased by John S. Goodway on August 8, 1923 for $22, 500 (Suffolk: Book 4494, p. 629). After building a road through the site which he named for himself, Goodway built 26 houses between 1923 and 1928, about 5 a year, of mostly one-family houses in the Colonial Revival style. Mr. Goodway kept the old North End Mission Home building and about an acre of land for himself. Eight houses are two-family houses, five of which are on Goodway Road. The earliest house is number 99 Florian, built in 1923. It is a wood and stucco house which matched the opposite cottages built a decade earlier. A duplicate of number 39 Southbourne, it was designed by Frederick M. Russell and built by Guisseppe Madonia of East Boston (Russell and Madonia would collaborate on several Goodway houses, such as number 43 Southbourne built in 1923). In 1924, Russell designed and Madonia built number 33 Southbourne Road in the Colonial Revival saltbox style. Smaller cluster housing set on common parkland. 78 Southbourne Rd. Built in 1914. Number 35 Southbourne Road was built in 1924 by Goodway, presumably for the Boston North End Mission. The house was designed by Russell as a Boarding House for Infants. Goodway is listed as owner and architect on the permit. Number 39 and number 85 Southbourne Road are the earliest houses in the district designed and built by Neal de Young, another architect who worked on several Goodway houses. Number 85 Southbourne, it will be remembered, was built at the original entrance to the North End Mission. Boston Dwelling House built the first two-family home in the district in 1925; Goodway built the next 8, but only one of his architects made an effort to disguise it as a single-family house. Number 17 ” (Neal de Young, 1926). Numbers 87, 91 and 95 Bourne Street were each designed by Weinbaum and Wexler in 1927 for Matthew Mc Issac on land he bought from Goodway. They were completed between Jan. and May, 1928. The North End Mission Home was known for many years as the Goodway Mansion. The house and land were sold by the estate of Mrs. Elizabeth Goodway to John F. Gately on July 12, 1963 (Suffolk: Book 7760, p. 444). Local legend has it that the old house burned. 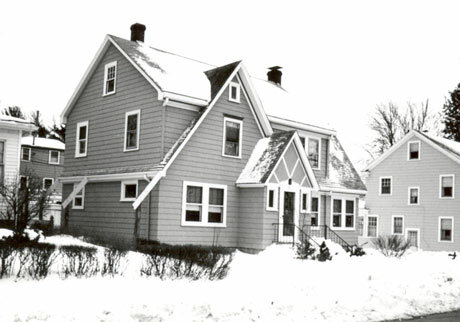 Gately built five single-family houses and one duplex on the lot in 1964. Number 30 and 34 Goodway Road were completed on September 3, 1964. Each cost $8000 to construct. The Boston Dwelling House Company changed its marketing strategy after 1929 when it sold large blocks of land to two developer contractors. The first was Martin J. Herbert. The second was James C. Martin who would complete the development of Woodbourne. Martin J. Herbert, like John Goodway, developed a street and named it after himself by buying up two parcels of land between Eldridge and Northbourne. He began by building the first six houses on Eastland Street between 1931 and 1933, numbers 5, 8, 9, 12, and 16 all designed by Albin Brodin. Number 15 Eastland was completed on August 16, 1934; number 9 and number 16 Eastland were completed on Jan., 1933. Martin Herbert built 5 homes on Herbertson Road all in 1930. The first house on the road is the corner two-family at number 19-21 Eldridge Street, completed in 1928. Harold Duffie was the architect for Denis O’ Connell, the owner. Herbert completed the block using three architects, William Campbell, Martin Boyle and a third identified on the building permits only as Mr. Devine. The largest house is number 12, designed by Campbell with its overlapping gambrel roof. Numbers 1, 11 and 21 were each two-family houses. Number 11, which was listed as Herbert’s address, was designed by Mr. Devine and completed on July 26, 1930, a few months after number 7. Martin Boyle designed number 7. Herbert is the first developer in the Boston Dwelling House Company property to plan his homes for the automobile age with built-in garages. The earliest documented houses in the district designed with built-in garages are numbers 22 and 26 Eldridge Road. Number 26 was designed by Max Kalman and completed on September 29, 1928. It is a two-family house set on a high robust foundation of red granite and brick. Many houses in Woodbourne had garages built at or shortly after construction of the main house in the second phase after 1922, but it was done almost as an afterthought and none has any detail to match the house. Only in Herbert’s small subdivision were the house and the garage planned and built as a unit. Numbers 9, 11, 12 and 15 each have garages below the first floor, as does number 50 Norhbourne. All take advantage of the slope of the land by having the garage below the grade of the street. An interesting change in use occurred in 1938, when John S. Goodway took a garage built in 1930 by Alexander Mc Donald at number one Meyer Street, directly below number 17 Goodway, and hired Albin Brodin to convert it into a three room house. The new house was completed on December 31, 1938. Topography played a significant part in the development of Northbourne Road. The northerly slope of Northbourne is steep and some of the houses — particularly numbers 43 and 47 — are nestled into the hill like ski lodges. All of the ten house built on Northbourne have garages. Some of the garages are built into the slope of the hill below the house. The ten houses were built between 1929 and 1941 by different developers and architects. Each house, however, was designed with a garage built into the structure. Herbertson and Northbourne Roads were the first streets in Woodbourne to acknowledge the fact of the automobile as part of middle class housing. Northbourne is also the first street to see the rise of that most famous of post-war domestic houses, the Cape Cod. Part of the Colonial Revival style, the Cape Cod style was very adaptable to location and budget. Almost all the houses on Northbourne are a derivation of the Cape Cod house. Numbers 55 and 29 are the two oldest houses, each built in 1929. Neal de Young was the architect and H. C. Cogell (of 124 Bourne Street) was the developer of both houses. Albin Bodin designed number 64 in 1931 to fit on the small lot left over from the acquisition for school property. Number 47 is the most interesting on the street because of the way it is perched on the hillside — built right into it actually — with its garage below it at the street level. This is a Cape Cod style house designed by George Couttes for Josephine Rockwood who lived at 18 Goodway Street. The house was completed on February 18, 1935. Number 43, also built by Josephine Rockwood, is set on a high stone foundation with the garage built under the first floor. This house, together with number 51, was designed and built by James C. Martin, a developer/ architect/ contractor who would complete what the Boston Dwelling House Company began in 1911. Number 43 was built in 1937, number 51 in 1938. The Great Depression all but stopped most home buying and construction. In 1934, the City of Boston took 77 house lots from the Boston Dwelling House Company for back taxes. (See attachments to Certificate of Title # 5085, Feb. 21, 1913. Suffolk Registry Book 21, p. 85). Almost all of these lots were on Eastland, Wayburn and Woodbourne Road with a few others scattered on Walk Hill Street. Most of these lots would be built on in the next fifteen years by the architect/contractor James C. Martin. On June 22, 1934, Martin bought the Woodbourne Clubhouse and its half acre lot containing the tennis courts. He took out a mortgage for $3,600 on the property. He altered the clubhouse into a single-family house and added a garage in the basement below the grade of the street. The building permit was issued on April 25, 1935. Martin’s first project was a house he designed and built next door at number 76 Bourne Street; the permit was issued on June 14, 1935. It has a very steep, narrow gable with an asymmetrical chimney. The house is on the edge of an incline and Martin used this slope to create a driveway to an understory garage. The house was sold on April 22, 1936. Martin then built number 66 Bourne Street which was completed on October 19, 1936. It was purchased on January 20,1937 with a $5,300 mortgage. Martin built on whatever scrap of land he could buy up. In 1937, he bought a part of the common green of Robert Anderson Pope’s plan for the Southbourne Road cluster houses, a wedge of land between number 18 and number 30. Martin had the property lines altered and turned the common service drive built in 1912 to the brick row houses into a driveway to a small house he designed, numbered 24 Southbourne Road. There are unverified stories that other houses were planned for the common greens along Southbourne Road, but these were apparently resisted by abuttors. At the same time, Martin began to buy up house lots in bulk: 19 lots were purchased on August 9, 1937, mostly on Woodbourne and upper Eastland Street and two lots on Walk Hill Street (numbers 115 and 119). Thirteen more lots were bought on the same streets on Jan. 3, 1942. Some of those lots he built on sooner than others, depending upon a willing buyer. He completed number 30 Eastland in June 30, 1938. He acquired the lot of 110 Bourne Street in 1937, but did not complete the house until Sept. 6, 1942. The lots for numbers 115 and 119 Walk Hill Street, purchased in 1937, were also not built on until 1942. Number 8 Eastland was not completed until 1947. Martin designed and built all of them. The remainder of the Boston Dwelling House Company subdivision of the Woodbourne estate of the Minot family was not fully completed until 1964, a full half-century after the noble experiment was begun. By then Woodbourne was just a typical post-war subdivision unremarkable from all the rest going up on vacant tracts in West Roxbury, Roslindale and Mattapan for men and women in the war industries, and then for returning servicemen and their new families. New ranch and Cape Cod houses were a far cry from the triple-decker flat on Weld Hill Street, and in the post-war economy, the working man could afford to buy his own house. Only the curving streets laid out by the visionary Robert Anderson Pope remained of the original plan for Woodbourne. Increased automobile use caused the City to widen Southbourne Road in 1943, which resulted in the narrow sidwalks along the north side of the street. Wachusett Street was rebuilt to City standards in 1938 from Eldridge to Southbourne. The intersection of Bournedale, Northbourne and Bourne has been repeatedly widened at the expense of property owners so that it resembles the central square proposed for the intersection by the Olmsted firm. What is the meaning of Woodbourne today? Woodbourne was a 20th-century transition development in three ways. First, a transition in domestic housing styles from the eclecticism of the late 19th-century, seen so clearly on Patten Street to the truly New England-style house developed after 1922: The Colonial Revival housing style had deep roots set in the 17th and 18th century of the region. The houses of Woodbourne built after 1922 evoked a familiar feeling to the community, especially the Cape Cod houses on Woodbourne, Waybourne and lower Eastland Streets. Second, the transition in housing styles that adapted to the automobile: Upper Wachusett Street is a street built before the automobile; so is Southbourne Road. The cluster group of housing built in Woodbourne Saltbox style on Bourne Street made no concession to the automobile, even though land was available. Northbourne and Eastland were built in styles which acknowledged and planned for the automobile. Third, the transition in the design of private spaces: Woodbourne was originally designed as cluster housing set amidst green commons. The second phase of development discarded that plan, but it can be argued that Woodbourne itself, especially south of Eldridge Street, is one huge cluster housing. It is not a sprawling subdivision. It has boundaries and entrances. Its boundaries are Walk Hill Street and the tree line of Forest Hills cemetery on the north, St. Michael’s Cemetery on the east and Hyde Park Avenue on the west side. Walk Hill Street is the approach drive and Bourne Street is the gate on the north. Northbourne and Southbourne Roads are the entrances off Hyde Park Avenue, as Robert Anderson Pope planned them to be. The one failure was the apartment house complex on Hyde Park Avenue, carefully designed by Kilham and Hopkins as a new form of the triple decker by the Boston Dwellinghouse philanthropists. BDH Co managed the apartment complex until 1924, when it changed into a real estate venture and sold the buildings. Thereafter the apartments had an unhappy life. They changed owners several times, were constantly in arrears for non payment of water and coal bills, and were finally taken by the City of Boston in 1951. A new private company refinanced the apartments in 1954 with a ten-year, $162,000 mortgage. A new owner took possession in 1971, but the City of Boston foreclosed on the buildings for non-payment of taxes in 1976. By then, the buildings were in such disrepair, that the City condemned them all, boarded them up and razed them 1978. In that year a new form of philanthropist took possession of the land, the Greater Boston Community Development Corporation. Acting through its subsidiary, Woodbourne Community Housing Corporation, it took title to the property on September 25, 1978. On September 21, 1978 it secured a mortgage and security agreement with the Department of Housing and Urban Development for $2. 9 million for a complex of high- and low-rise apartments for senior citizens. The building permit was issued on September 19, 1978 for a 4-story, 67-unit apartment block along the length of Hyde Park Avenue from Northbourne to Southbourne Roads; on July 11,1978 permits were issued for two, 2-story buildings of 4 apartments each on the corner lots of Southbourne and Northbourne Roads and Hyde Park Avenue. Chia-Ming Sze was the architect. Now twenty years old, the elderly housing complex is well managed and the buildings are in good condition. As architecture, they are homely. The main building is a huge, plain brick box that acts as a wall shielding Hyde Park Avenue from the tidy neighborhood behind it. Good housing and good architecture did not succeed in this new philanthropic venture. Woodbourne was the last of a long and distinguished line of philanthropic housing which grew out of the tenement house reform movement of the 1850’s in Boston. It was an experiment of a vision to provide affordable housing for the workingman, but like its predecessors it failed because the business/philanthropist investors could not comprehend that wages never kept up with prices. The promise of Woodbourne was illusive to the workingman on the Boston Elevated or on the shop floor of Sturtevant Blower Works. Woodbourne was unique in that its architecture and landscaping were given extraordinary thought; both were an integral part of providing affordable model homes. It was the type of planned community which Boston 1915 wanted to see become part of the 20th-century city. Like all other housing reformers beginning with the Model Lodging House Association incorporated in 1853, Boston Dwelling House Company believed that good housing made good citizens; homeownership also made good Americans, especially the foreign born who could not be assimilated fast enough for the leaders of Boston 1915. But whereas the other reform-housing ventures depended on careful screening of tenants and homeowners and a system of (mainly) women managers, who kept a sharp eye on household morals while collecting the rent or mortgage payment, Boston Dwellinghouse Company believed that a well-designed home set around beautiful parkland and carefully landscaped grounds would be the great civilizing force. Indeed, it is the architecture and the landscaping which makes Woodbourne so special even today. Few people know about or visit the Sunnyside and Roundhill houses, much less Waterlow Street. Finally Woodbourne is unique because it was the last experiment in private philanthropic housing in Boston. Thereafter housing which was affordable to the workingman and the impoverished would be built by government. Fifteen years after the Boston Dwellinghouse Company shifted from philanthropic housing to a simple real estate venture in 1922, the Wagner-Steagall Public Housing Act of 1937 was signed by President Franklin Roosevelt. Decent affordable housing was now the policy of the United States Government. • The Massachusetts Homestead Commission of 1915. • Emergency Government Housing for defense workers of 1918. • The Federal Home Loan Bank Act of 1932. • The Emergency Public Works Program Housing Division of 1933. The Massachusetts Homestead Act of 1915 was the first public housing program in the United States. Housing reformers had originally looked to government to regulate the worst aspects of private sector housing. The earliest regulatory law was the 1868 Tenement House Act. This set height limitations and minimum dimensions for house-lot size, yards and interior courts. The introduction of building classes was established in 1892. This legislation created categories of buildings according to their degree of fireproofing. Each class carried its own set of regulations. First Class — fireproofing throughout, steel, concrete or masonry with plaster walls and ceilings. Second Class — wood frame with exterior and party walls of masonry. Third class — wood construction. Yet as Christine Cousineau points out in Tenement House Reform in Boston, government regulations and slum clearance did not create better housing for the low-income wage earner. The lack of housing alternatives was a strong impediment to a more forceful slum clearance program, and the Board of Health was reluctant to destroy poor peoples’ homes. Not only that, but housing reform through regulation increased the cost of new housing by as much as 15 percent. In response to mounting criticism of the decrease of low-cost housing, some building codes were dropped in 1906 and 1907. One chief critic of regulations was none other than Robert Treat Paine Jr. The long-standing impulse of housing reformers to build workingmen’s homes in the suburbs was joined at the beginning of the 20th century by the nascent city planning movement which advocated for public policies that would relieve the overcrowding of central cities. Ebenezer Howard, one of the prime movers of the garden city movement and a major influence on the planning of Woodbourne, wrote an influential tract in 1902 called Cities of Tomorrow. In it he called for planned communities of small houses and gardens built around the core city. This is exactly what was planned and first built at Woodbourne. The main problem remained — as it did at Waterlow Street — that the gap between workers’ wages and the downpayment and monthly mortgage was insurmountable for the average workingman to afford to buy in these suburban garden villages. In 1908 a group of reformers began to push for the first time for direct government construction of housing. The Housing Committee of Boston 1915 and the Boston Chamber of Commerce were unanimous in pressing for legislation for the planned decentralization of the metropolitan area. The result was the Massachusetts Homestead Commission of 1911. In 1912, it reported out a bill which authorized the Commonwealth to purchase, lay out and build suburban houses for workingmen (MGL Chap. 595/Act of 1913). In 1915, the Homestead Amendment to the Massachusetts Constitution passed both houses of the legislature and was ratified overwhelmingly in a public referendum: “The General Court shall have the power to authorize cities and towns to take land and to hold and improve, subdivide and build upon and sell, for purposes of relieving congestion of population and providing homes for citizens.” In the words of scholar Christine Cousineau, this was America’s first public housing program. World War I halted further construction, however, and the remaining land was turned into Victory Gardens. Pressure from the real estate and construction businesses worked against the Commission from the start, and these antagonists increased their opposition when construction halted. Their lobbying succeeded: the Legislature refused to appropriate funds the next year and in 1919 the Homestead Commission was buried within the new Department of Public Works. The housing and planning sections of the Commission did not survive the reorganization. It was also in that same climate that the philanthropic housing impulse of the Boston Dwellinghouse Company surrendered to private enterprise at Woodbourne. EMERGENCY GOVERNMENT HOUSING FOR DEFENSE WORKERS: THE UNITED STATES HOUSING CORPORATION, 1918-1919. Overcrowding of the central city was the main force behind the establishment of the first public housing legislation in the nation. The First World War was the main force behind the first public housing program built entirely by the federal government. With the entry of the United States in the war against Germany in 1917, munitions plants, steel mills and shipyards across the country greatly increased production, which required the hiring of tens of thousands of new skilled and unskilled workers. Thousands of these workers required housing which the private real estate market could not provide. Over the summer of 1917, the housing shortage became a concern to the federal government because the inadequate supply of housing was making it difficult for defense plants to find and keep workers. Consequently, the production of warships, heavy equipment and munitions were in danger of falling below the demands of the battlefield. Housing became a war emergency, and Congress created two entities early in 1918 to meet the need for housing of defense workers: the Emergency Fleet Corporation (United States Shipping Board) was established in March,1918 with an appropriation of $95 million, and the United States Housing Corporation (Department of Labor) was established in June of 1918 with an appropriation of $60 million. This was increased to $100 million in July. Twenty-one corporation towns from Maine to Vancouver were built by the Emergency Fleet Corporation (EFC). The first and largest was Yorkship Village at Camden, New Jersey. Over 2000 houses were built on 225 acres for the New York Shipbuilding Company. The first 900 were completed by June of 1918. In April of 1918, Kilham and Hopkins — the architects of Woodbourne — were appointed to design and plan a community for the Atlantic Shipbuilding Corporation in Portsmouth, New Hampshire. Named Atlantic Heights, 300 houses were built over 30 acres by October, 1918 (the architects completed the house plans in three weeks). The September 1918 issue of The Journal of the AIA featured a description of this development. Forty-four townships across the country were built by the United States Housing Corporation. The first one was at Bridgeport, Connecticut where 5 separate developments were designed by R. Clipston Sturgis of Boston, beginning in May of 1918 (described in Architectural Record, February, 1919). Overnight, in the words of C. Stanley Taylor in American Architect (December, 1918), “the greatest single owner of workingmen’s houses in America was the United States government.” This was housing on a massive scale never before seen in the United States, and it was carefully watched by housing reformers and architects alike. 2. The rising cost of lumber. 3. The rising cost of wages in the building trades. 1. The houses must be reasonably attractive and provide the essentials of light, air, warmth and convenience of living. 2. The houses must be built substantially and well. Type 5. Hotel for men. 2. Requirements for light and cross ventilation. 3. A minimum of 20 feet between buildings. 4. Requirements for adequate back yard space: a minimum of 50 feet between buildings in the back with at least a 20 foot yard for each house. 5. Absolute prohibition of living spaces in cellars. One standard would have a significant impact on all future housing and that was the organization of interior spaces for specific purposes. Bedrooms, kitchens and living rooms were designed specifically for those uses, a feature unknown in worker’s housing before 1918. The first public housing developments in Massachusetts were three separate tracts built by the United States Housing Corporation at Quincy to serve skilled and unskilled workers employed at the massive Fore River Shipyard. A 12-acre tract of 21 temporary barracks was also built for single men hired as laborers; these were torn down after the war. The three tracts of single- and double-family houses not only still stand, but are thriving middle class neighborhoods that have been completely integrated into the weave of the housing built up around them after the end of World War One. The largest is the Baker Yacht Basin tract of 22 acres on which 218 detached, 2-flat houses were built and 18 duplex houses for a total of 218 families. It was planned for unskilled men with families and the density here is greater than at the other two smaller developments. Baker Yacht Basin faces the bay and the houses are laid out in a grid. One street of houses overlooks a pretty bayside park. A second small park is on the Washington Street side of the development directly opposite the shipyard. The Arnold Street development by contrast is built on 18 acres and the lot sizes are much bigger. Some of the houses are built of brick and the others constructed of wood. The streets are curved to conform with the topography. Arnold Street resembles the Woodbourne subdivision in the curving streets, large lots and the use of Colonial Revival housing styles. 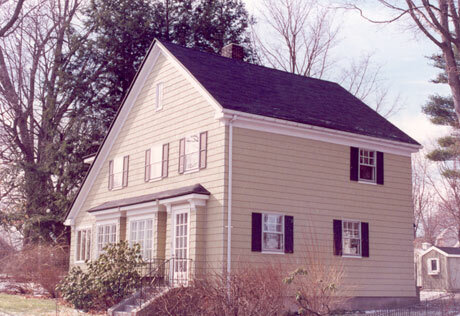 Both developments are united in the use of the Colonial Revival style, but in particular at Arnold Street; here the gambrel roof, salt box and Cape Cod styles are used with more accuracy. The architect of the Quincy houses, James McLaughlin, used the shed roof of the 17th-century farmhouse as a device to carry the stairs to the second floor apartment in some of the houses he designed for the Baker Basin tract. The gambrel roof and the Cape Cod were carefully reproduced at Arnold Street. The abrupt end of hostilities in late 1919 found many US Housing Corporation developments — like parts of the Quincy developments – incomplete, but they were finished and promptly sold at auction after the armistice was signed. A walk around the Baker Yacht Basin and Arnold Street developments today — nearly 80 years after they were built — proves the accuracy of these lines, probably written by Walter H. Kilham. In an article on Atlantic Heights in Portsmouth, NH , published in the September, 1918 Journal of the American Institute of Architects, he wrote, “if there are doubters of the value of good houses they might inquire what will become of all the government built houses. …These houses are the only tangible permanent assets left from all the twenty billions expended in the War for Liberty. It is worth while to remember that no private capital would have had the courage to take the situation in hand with such foresight and forethought as the government has shown.” This was written by the same architect who designed the philanthropic housing development called Woodbourne only six years earlier. It took another emergency, the catastrophe of the Great Depression to force government again to take direct action in providing housing. The recovery of the American economy in 1921 from the recession following the abrupt conclusion of World War I resulted in an explosion of domestic housing construction across the nation. Indeed, between 1922 and 1930, 87 houses were built at Woodbourne, an average of ten a year. In that period too, as has been discussed, Woodbourne reverted back to the usual house-building method of the small contractor, local architect and individual mortgage lender. The ending of the philanthropic housing experiment also ended the planned streetscapes of unified cluster housing that characterized both the Boston Dwellinghouse and The United States Housing Corporation developments. With the return of prosperity, the era of city planning in the construction of domestic housing came to an end. Presiding over this prosperity and the lush housing market was Secretary of Commerce Herbert Hoover. In 1921, he established a Division of Housing and Building within his agency to promote home construction and home ownership. It is ironic then, that as President, Hoover was faced with the double collapse of the housing market and the hopes of home ownership. After October, 1929, the question was not whether the federal government would become involved with housing but how (Gail Radford). For Herbert Hoover, government’s response was to strengthen the private real estate and financial markets by supplying the capital necessary to provide mortgages to buyers and loans to builders. This recognized the problem faced by every philanthropic housing reform program since the Civil War: the lack of capital necessary to build housing and the savings needed by the buyer for the downpayment. Robert Treat Paine was a rare visionary when he advocated in 1881 for the creation of pools of capital available to the workingman. The Workingmen’s Loan Association was formed by Paine in 1887 to support his Workingmen’s Building Association. The President’s second response was to encourage cooperation among the various actors in the business community. He believed in self regulation and from his days as Commerce Secretary convened numerous conferences to bring people together on issues for common action. He used that same method to combat the Depression. On October 4, 1931 the President convened a conference of economic leaders to urge upon them that they pool their resources and create a $500 million fund to halt the foreclosure of mortgages by life insurance companies. But private business was not anxious to use its own resources to resolve a national crisis and the response was poor. Hoover tried again. On December 8, 1931 he invited 4000 people tp the President’s Conference on Home Building and Homeownership. In his opening remarks, the President urged the delegates to put their personal financial problems aside, and focus instead on the importance of preserving the private enterprise system of housing. Hoover proposed something very new: a government lending agency that would supervise a system of banks and mortgage lenders. On July 22,1932, Congress passed by a narrow margin the Federal Home Loan Act which was designed to stimulate new construction as well as to reduce foreclosures. In the words of scholar Gail Radford, “It was the first permanent piece of federal housing legislation.” It was also something more: a Republican maneuver to stave off direct government construction of housing. To shore up the weakening financial institutions, Hoover proposed, and Congress authorized, a gigantic lending machine called the Reconstruction Finance Agency (RFC) that put government revenues into banks and insurance companies. The RFC was authorized to borrow $2 billion and it quickly loaned out $1 billion to banks and insurance companies as well as farm support loans. In July of 1932, the Relief and Construction Act further empowered the RFC to provide loans to state and municipal governments for low rent housing and slum clearance. The Republican leadership of the Hoover administration refused to consider any proposal to combat the Depression which would compete with or replace the free market system, especially in housing. But the Relief and Construction Act provision for slum clearance did just that: it created the first modern public housing development in the United States, Knickerbocker Village in Lower Manhattan, southwest of the Brooklyn Bridge. Knickerbocker was the first and only project financed by the RFC during the Hoover administration. The project was the first to combine slum clearance with the construction of housing specifically for low-income residents. It was completed in 1934. In density it was huge — 1,600 units on just 3 acres — but it remains a solid middle-class community to this day. The Federal Loan Home Act — which is still in effect today — seems to have had an impact on Woodbourne. Between 1931 and 1933 ten new houses were built on scattered lots including 12, 42 and 46 Bourne Street, 50 Northbourne, and 12 Herbertson, as well as a clump of 5 houses built in 1933 on Eastland Street around the corner from number 12 Bourne Street. The 1932 Home Loan Act was strengthened by Franklin D. Roosevelt on June 12, 1933 when he signed into law the Home Owners Refinancing Act, which created a federal corporation to underwrite home mortgages and advance cash for repairs. The first loan authorization was $2 billion. It not only saved homes, it was also a brilliant political move because it created solid middle-class support for the New Deal at the start of that amazing revolution in government intervention. The private housing market did not respond to the loan programs of the Hoover administration, and Franklin D. Roosevelt was confronted with galloping mortgage foreclosures, massive homelessness, as well as staggering unemployment, when he was sworn into office in March of 1933. With the Roosevelt administration came the last step of government involvement in providing housing for the working man and the low-income family in the United States — housing built and managed by government authority. In June of 1933, President Roosevelt signed into law the National Industrial Recovery Act (NIRA). Title II of the Act authorized a comprehensive program of public works including “construction and reconstruction of low cost housing and slum clearance.” Congress appropriated $3.3 billion for the NIRA. In July, Roosevelt appointed Secretary of the Interior Harold Ickes to direct Title II, named the Public Works Administration (PWA). Almost immediately, Ickes announced the creation of the Housing Division within the PWA. In its often tumultuous 4-year life, the Housing Division financed or directly built 58 housing developments across the nation. In the first year, the Housing Division financed housing developments with low-interest loans to limited dividend corporations. These corporations were very much like the Boston Dwellinghouse Company and the Boston Cooperative Building Company. One project tentatively approved in the late summer of 1933 was to the Neptune Gardens Corporation. Neptune Gardens was proposed as 700 units of housing on 44 acres of mudflats in East Boston, adjacent to Wood Island Park between Prescott Street and Neptune Road, including present-day Frankfort Street. As reported in the September ,1933 issue of Architectural Record, the development would be a mix of 2-story row houses, 2-family houses and 3-story apartments. The total cost was estimated to be $4 million, of which the Housing Division would advance a loan of $3.5 million. The developers selected as architects the firms of Blackall, Clapp and Whittemore; Clark, Sturgis Associates; and George Nelson Meserve. Although the Architectural Record printed a schematic plan of this ambitious housing development, it was never built. Today the site is entirely taken up by the North Entrance Complex of Logan Airport. Too many limited-dividend developers failed and Ickes abandoned the program in February of 1934; thereafter the federal government would finance and build housing. During this highly-visible 3-year period, the Housing Division built 51 projects across the country and Puerto Rico. Only two were in Massachusetts: Old Harbor Village in South Boston and New Towne Court in East Cambridge. Old Harbor Village — today called the Mary Ellen McCormack Development — was a $6.6 million housing program built on 26 acres of vacant land between Dorchester Avenue and Columbus Park. The land — some of it unfilled marshland — was acquired between September and October of 1935. It was a combination of 3-story apartment blocks and 2-story row houses and contained slightly over 1000 housing units. New Towne Court was built on main Street near the Boston and Maine freight tracks just west of Kendall Square in a thickly settled factory district. New Towne Court was in contrast with Old Harbor in three ways: the land was acquired through land condemnation and slum clearance; it was much smaller with 300 units, and much denser — a cluster of 3-story apartment blocks around open courtyards. These government constructed housing developments were unlike the emergency war housing of 1918 in three dramatic ways. The first was they were built in direct response to an internal national emergency to house the homeless, the low-income family, and the workingman. Second, they were built to provide jobs for architects and contractors. Third, and the most lasting to this day, they were the first housing which used the European design of domestic architecture that had enormous influence on younger architects in the 1920s. This style became the mold for every public housing development built afterwards. The style was marked by a complete lack of ornament; functional-shaped brick or cast-stone apartment boxes of 2 or 3 stories set in parallel rows; and the destruction of the city street with the boxes laid out in T-shape, L-shape or X-shape superblocks, surrounded by common spaces for playgrounds, drying lines and grassy squares. They were the tribal grounds of Robert Anderson Pope’s plan for Woodbourne magnified 100 times. Old Harbor Village — unlike New Towne Court — has traffic roads through the development but, like those in Woodbourne, these are narrow and curving public ways. Also like Woodbourne, Old Harbor has many common green spaces and playgrounds around the superblocks. The 3-story apartment houses face east towards Carson Beach. These blocks are clustered in the center. The better-looking row houses are on the outer edge; one row backs up to the brick wall which separates the development from the Old Colony Railroad (now the Red Line). Old Harbor Village today is a pleasant, shady residential community. New Towne Court has no interior public streets but wide-paved courtyards — perhaps once grass lawns — relieved by grassy squares between the superblocks of brick boxes. A team of 5 architects designed New Towne, including Charles R. Greco and Isidor Richmond. A team of 17 architects designed Old Harbor, including one woman architect, Eleanor Manning O’Connor. New Towne Court in 1997 and 1998 had major renovation work done on the apartment blocks, not least of which was a revolt against 1920s European-housing design by the addition of ornamental cornices and buff-colored corner strips to relieve the monotony of the brick boxes. The Boston Housing Authority was established on October 1, 1935 to take advantage of the housing loan programs of the WPA, but it lacked the legal power to build, own and operate low-rent housing. The United States Housing Act of 1937 established the United States Housing Authority (which is today known as HUD, Housing and Urban Development). Following its passage, the enabling legislation of the BHA was amended to conform to that Act; thereafter, local public authorities would design and build housing with federal grants. The Housing Division of the WPA had no impact on construction starts in Woodbourne. A second piece of legislation did have a great influence on the third, and final, phase of the construction of Woodbourne: the National Housing Act of 1934. This Act created the federal Housing Administration which provided federal insurance for home rehabilitation loans and mortgages for newly-purchased homes. The insurance lowered the risk of the mortgage industry, which encouraged private capital to get back into the residential housing business. In 1934, new housing starts were up for the first time since 1926. At Woodbourne, James C. Martin took full advantage of the FHA program, first by buying and remodeling the old Woodbourne clubhouse into his own two-story residence in 1934. Over the next 20 years Martin would complete what the Boston Dwellinghouse Company began in 1911. In 1934 the government was now in full control of providing housing for the workingman beyond the wildest dreams of the philanthropic housing reformers such as Bowditch, Paine and Filene. Yet, today, the private housing market cannot provide for those below the necessary income level. The August 27, 1998, South End News reported on the “struggle to find affordable homes.” At century’s end, home ownership still remains elusive for many Americans.